Yesterday was gorgeous, after a weekend of rain and a gloomy, overcast start to the week, the sun shone and it was so nice and sunny that me and Bernard spent most of the day out in the garden doing some sewing (okay, he wasn’t sewing, but instead curled up on my lap which felt somewhat like having a hot water bottle on my knees as he’s a very warm kitty)……I’ve become rather obsessed now with making more hexagons, the cushions from last week were intended as a way to use up the hexagons I’d found whilest tidying but as they began running out I couldn’t help myself and began to make more…..
One of the many things I love about making hexagons is that they are so portable which is why I sat out in the garden slowly turning pink with a pile of pinned papers on the little table in front of me…..and Bernard much prefers me to hand sew when he’s all cuddled down on my lap…he’s not a fan of my sewing machine. I finished up the third cushion cover, a big square one this time which will go on the nanny chair (Bernard was pulling the other two cushions about so I thought to make one for what is really his sulky chair….he tends to sit there when he’s not feeling so cuddly)…..such a mix of fabrics, colours, prints and patterns…..as always there are some proper favourites that I use a little of in nearly all my patchwork, but there are also fabrics used which normally I’d wrinkle my nose up at…just small pieces of prints I find less than appealing seem to work when they’re cut down and mixed in with a selection of fabric more in tune with my tastes. When I’m hand sewing the patchwork for my quilts I’m really fussy about which fabric I’m using, I tend to shy away from using “vintage” sheets as I find that a lot of them aren’t 100% cotton so don’t feel nice to sew or they bobble or the fabric has worn really thin….even though I’ve seen some really bright and cheery quilts made from them, using them isn’t for me….however their mix of print and gaudy colours is ideal when I’m lining Christmas Stockings or hot water bottles and have found small scraps of them work fine when I’m making hexagon patchwork…. 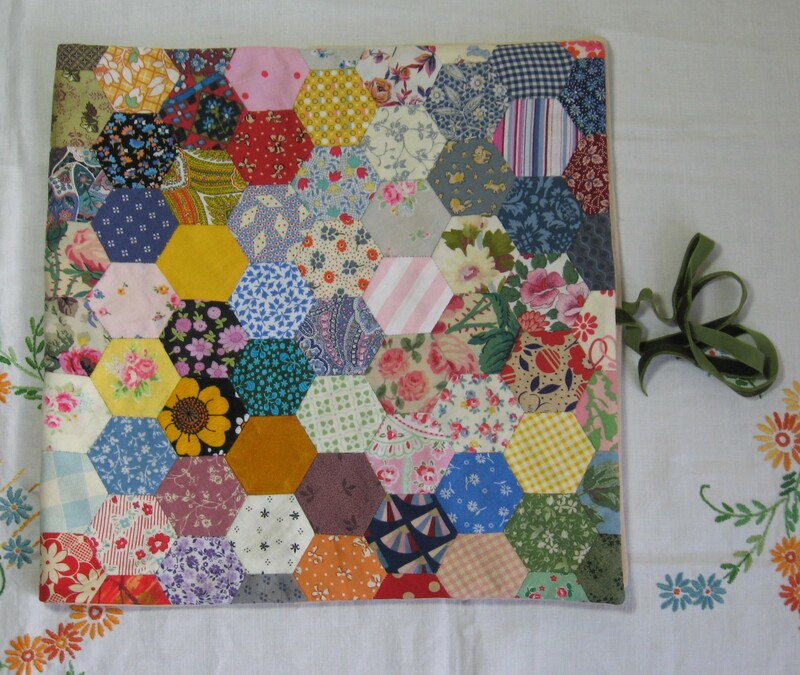 I really like how the patchwork looks from the back…..I sew my hexagons a bit different in that I don’t sew through the paper template but instead stitch the fabric securely to itself at the corners, making a little pocket for the paper to sit…..the papers come out pretty easily and it’s a lot less pfaffy than having to cut all the basting stitches out….but also the hexagons keep nice and neat on the back, giving a bit more structure and stability to the patchwork as a whole. 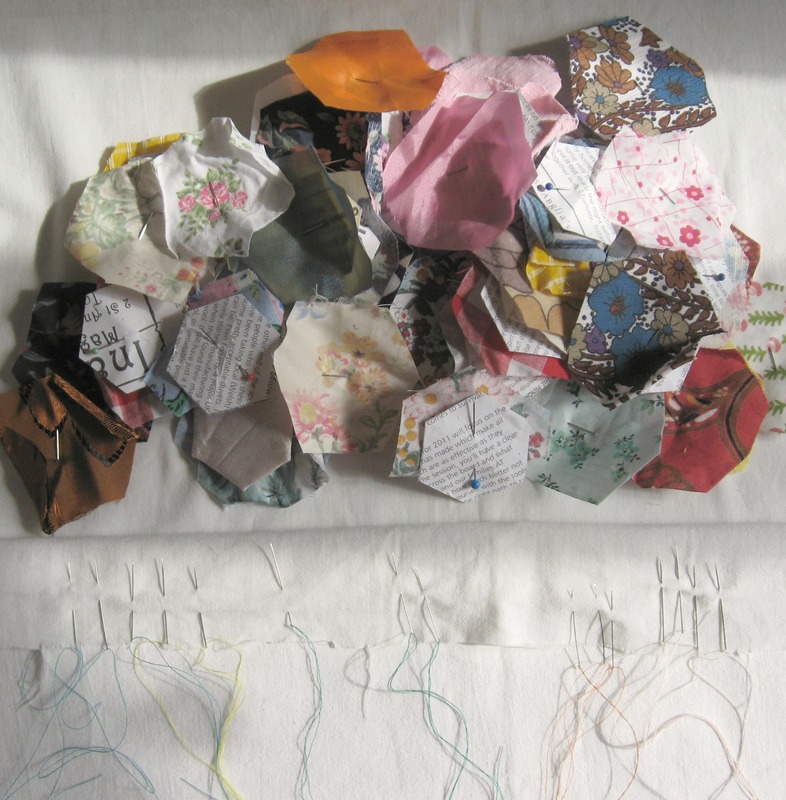 A lot of these are fabrics I wouldn’t dream of using for a quilt patchwork but I love how they combine together when sewn over papers….there’s something nice about about being able to use up pieces form a scrap bag and making something from nothing. I love how each cushion is different yet they sit together beautifully, they’ve all got fabrics in common but also have one or two exclusive to themselves. *believe it’s September in the UK but is available now if you like in the US. 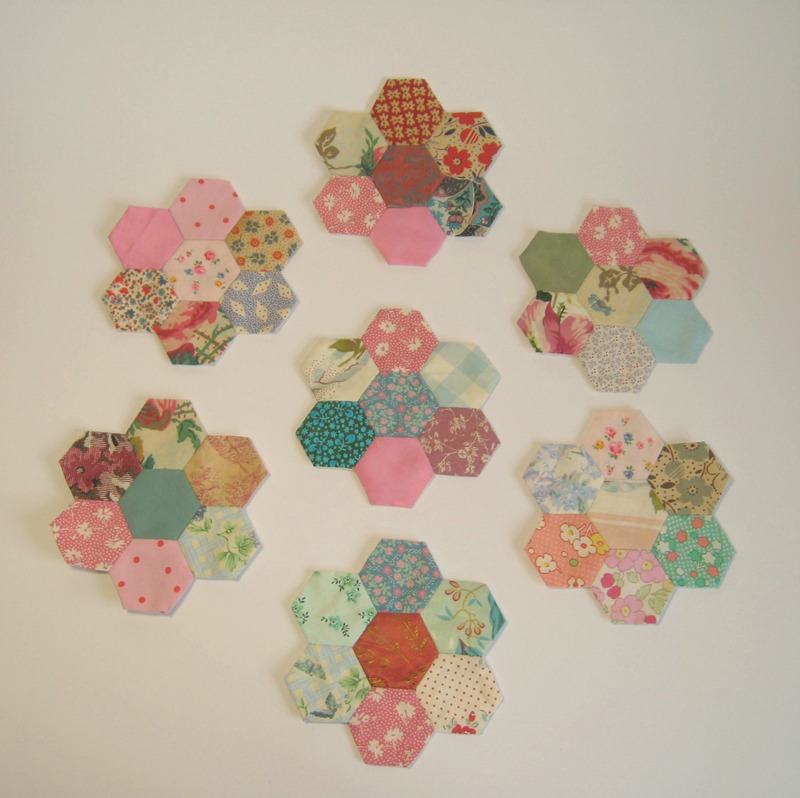 Fabric wrapped hexagons and using up each and every scrap…….. This is pretty quick to do and you’ll be amazed at how many you can get prepared like this in 15 or 20 minutes. Some fabrics may need a bit of an iron over if they are super crunched and wrinkly, though I don’t tend to bother if I’m using cottons, older fabrics that are a bit synthetic will only need just a very light touch. 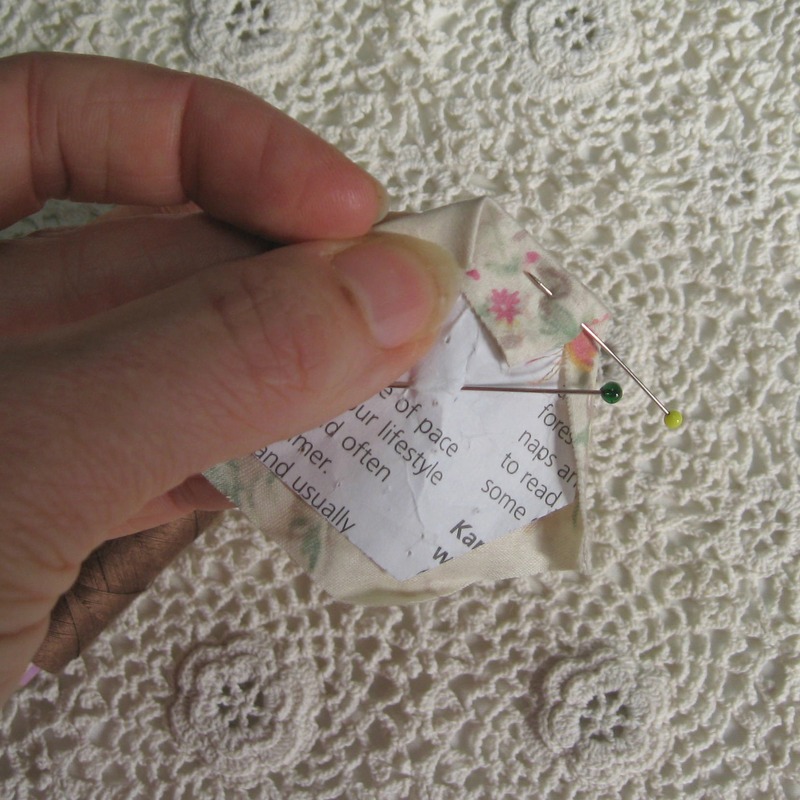 When I’m sewing the fabric in place around the papers I try not to poke my needle all the way through the needle, instead I only sew through the folds of the fabric and use 4 or 5 tiny stitches to hold the fabric securely in place, the thread then passes along the back to the next corner. 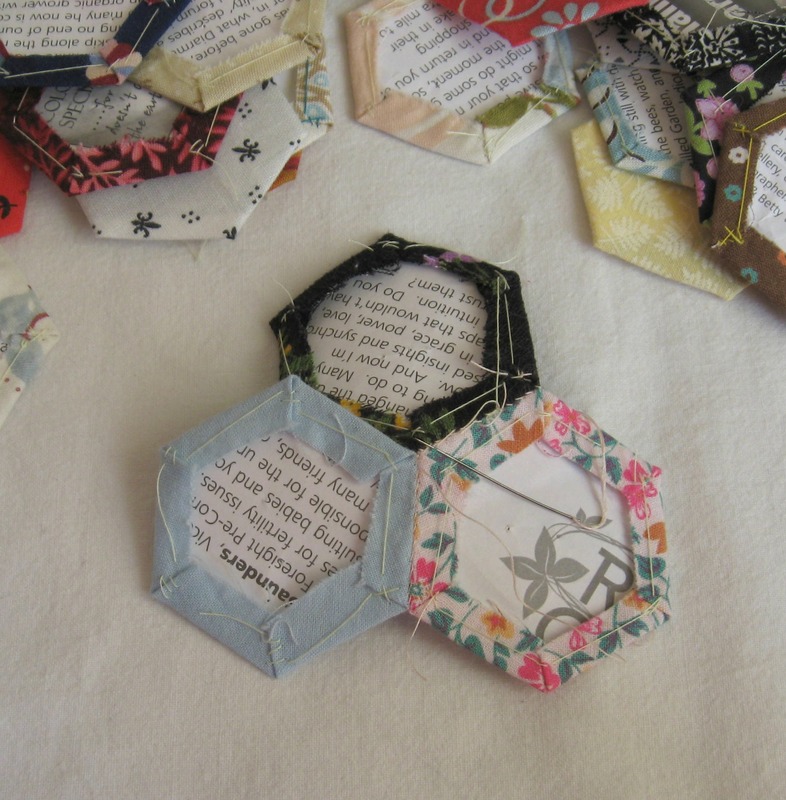 It’s a bit more fiddly than sewing through the papers like some books suggest, however when all your hexagons are joined together you don’t have to pfaff about removing all the threads from the hexagons but can often just shake or pop them out. 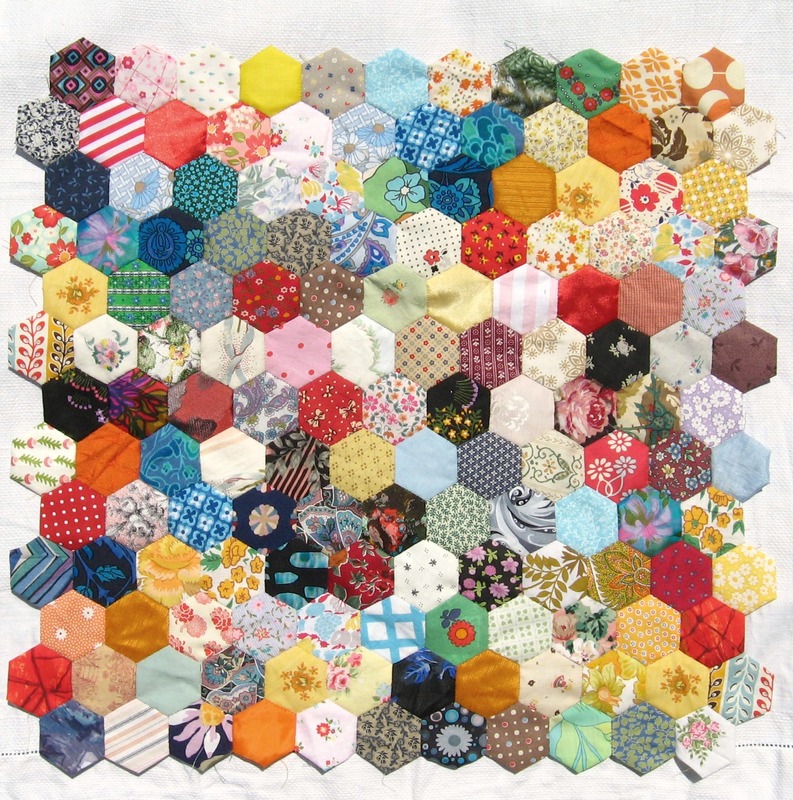 (and the stitches at the corner help keep the hexagon a neater shape and adds a bit more strength to the patchwork. I’ve seen examples of really old paper pieced patchwork where the papers were left in and were sewn into the fabric, the papers were then left in for extra warmth as these patchworks often weren’t quilted but just draped over the bed, so sewing the papers in securely makes sense for then, but I think nowadays you don’t have to do it like that. I use bright coloured basting or tacking thread, often in contrasting colours to the fabric I’m sewing in place as I find it easier to see my stitches and am less likely to think I’ve caught a lose thread in from the fabric if it is fraying at all. 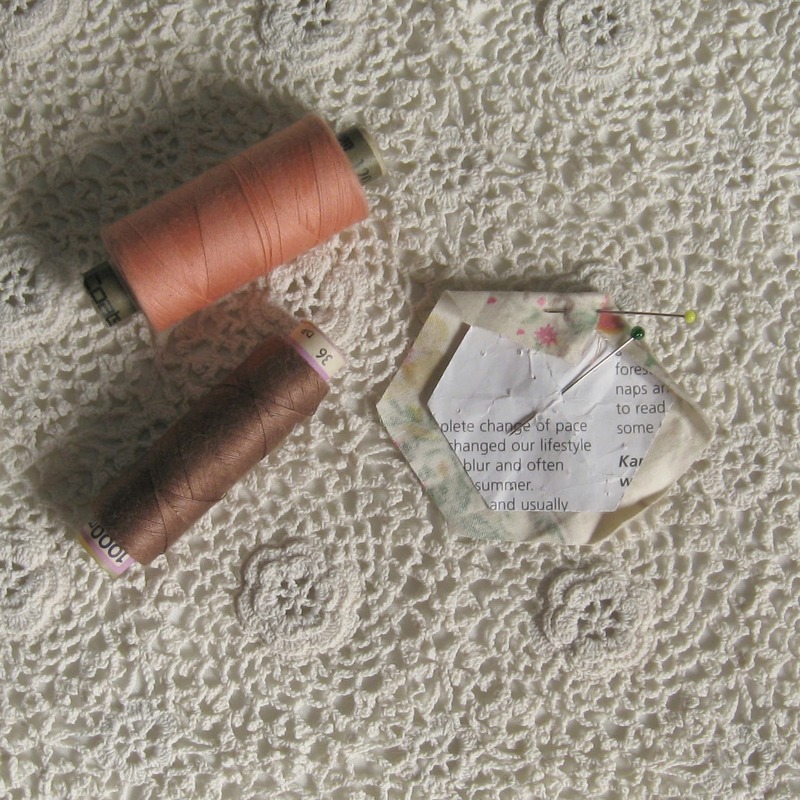 When I’m piecing the hexagons together though I prefer to use vintage threads (I always test the strength first, pulling tout a little thread and giving it a bit of a tug between my fingers, threads that break too easily aren’t purchased), most books suggest using grey threads when you are using a variety of colours and although I am happy to use them I also like using shades of brown and salmon pink….I’ve found these blend in really well and although the odd stitch may show it’s not something I’m going to lose sleep over….the vintage threads I particularly like are silky ones that are smooth and fine, they slip through the hexagon edges like butter. I find using the sharpest finest needle you can find makes paper piecing much easier, the best choice would be Clover Back Gold applique needles (they are a bit pricey, I think the last ones I bought were about £4.50 for 6 needles but they’re well worth the money and this is coming from someone who makes her own papers rather than spend the money on pre-cut ones…..I also like using vintage “sharps”…generally I find them to be sharper and stronger than most modern day needles and so skinny you can hardly feel them in your fingers. 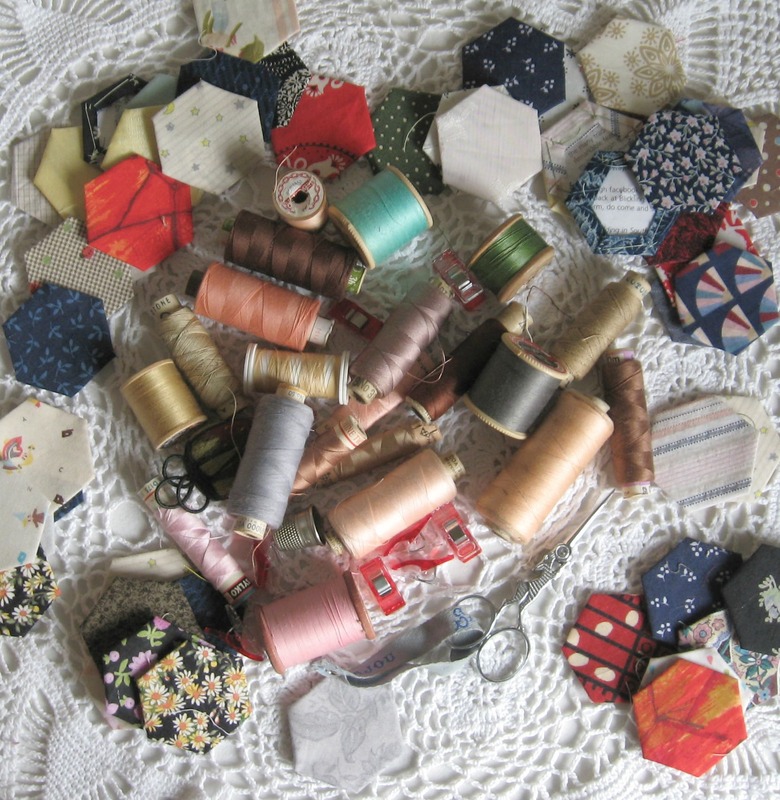 And apart from the traditional pin-cushion that I think every nanny’s sewing box held, I like using hexagons for other projects around the home too…I’ve listed a few of the things I’ve made below and hope they inspire you to make something yourself. Colour clash and patchwork for the sofa……………..
It’s a bit of a colour clash against the crochet blanket but I quite like that, the more colour on there the better in my book. 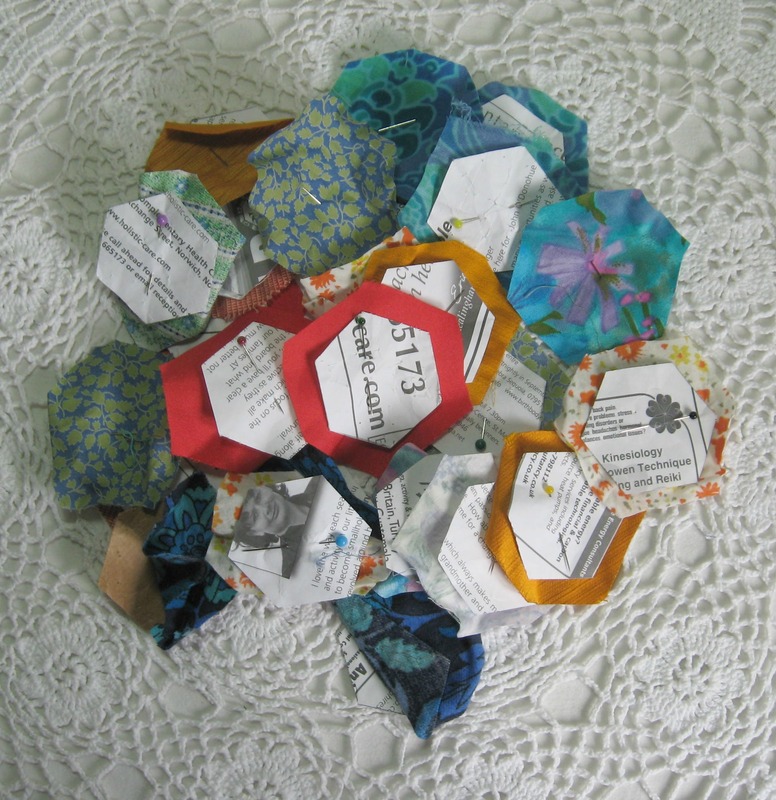 These came about from me having one of my many tidy ups (I start way more of them than I ever seem to finish) and in one basket I found a whole load of small hexagons (over 400 of them) and thought I should get on and do something with them…I’d pretty much said to myself that I wouldn’t start something new until I’d finished a few of the items in the pile of half made things in the bottom of the wardrobe and squeezed in amongst the shelves of fabric…but a little voice said these would definitely count towards finishing off a half started project……so after making two cushions and using up over half of the hexagons I feel I deserve a couple of gold stars for sure….. I don’t sew the fabric directly through the paper, instead I prefer to secure it at the corners and run the basting or tacking thread along the back, it sounds a bit fiddly but this works for me and I find it’s good because then I don’t have to take out any tacking stitches at the end. The papers are held in place fine and don’t drop out like you’d think they would. 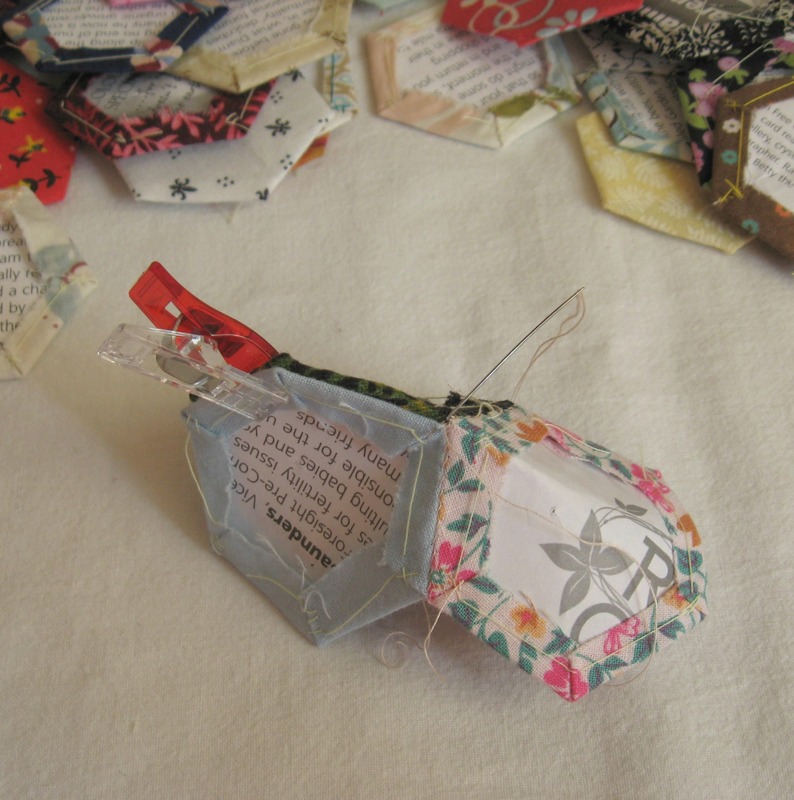 and when I’m all finished then the papers can be popped out no trouble. By themselves some of the fabrics are a bit….frumpy or fogey-fied (old fashioned in a bad way), but when they all get mixed together they look much better…also I think the prints look good because you only see a small part of them. I’m cheap so I make my own papers, you can now buy hexagon paper punches which if you do a lot of English paper piecing would save you money in the long run, however I know Sew and Quilt now stock an amazing range of hexagon papers (and other shapes too if your maths isn’t up to drafting all those triangles and diamonds)….the paper piecing goes a lot easier if you use really fine and sharp “sharps” or applique needles….Clover Gold Eye are a favourite of mine, and I also keep a look out for vintage “sharps” as I find they’re lovely and strong and super super skinny. 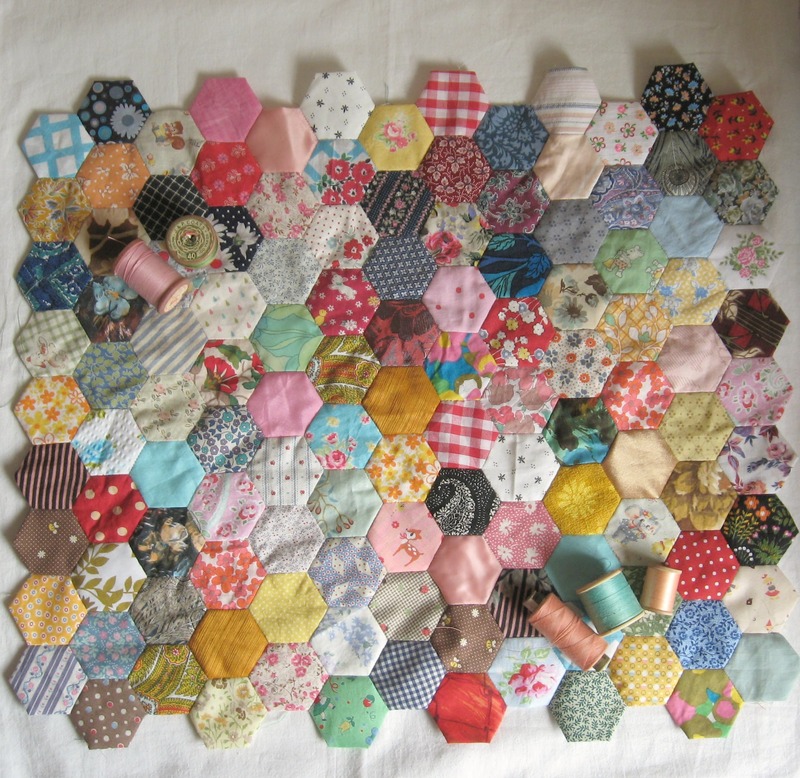 I also like using Clover Wonder Clips, I’ve got the small size and they hold the hexagons together so well, a lot less prickly than trying to jiggle patchwork held together with pins*. 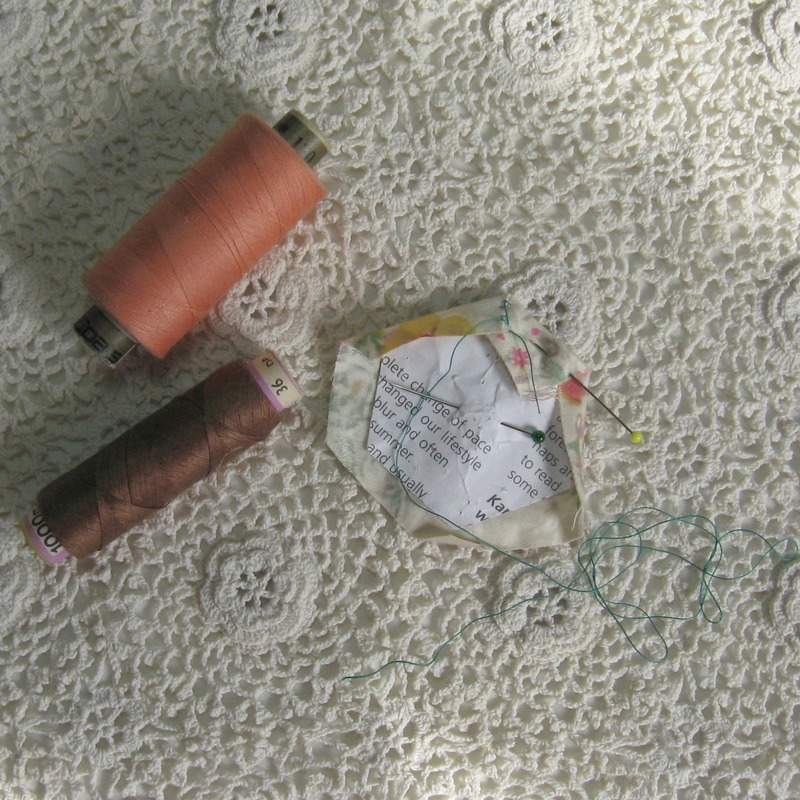 Start by clipping two hexagons together, and secure your thread with a few stitches along the back in one of the corners where the fabric is folded over on itself, then whip stitch tiny stitches along one edge of the hexagons to join them together…when you get to the corner, work back down for a couple of stitches to secure the thread. 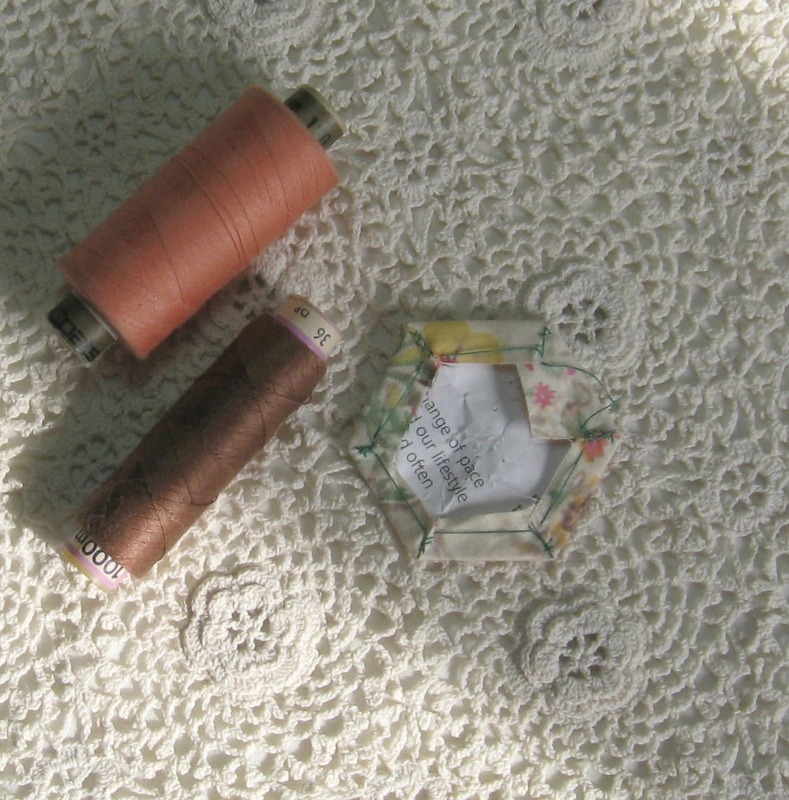 When you attach the third hexagon into place you start off like before, secure the thread into the back where the fabric is folded over on itself and use a wonder-clip at the end of the first edge of the hexagon to hold it into place and sew along the two touching sides, when you reach the end of that join, tuck the needle out of the way…..
Then fix the wonder-clip into place so it keeps the second edge of the third hexagon secure, and now begin sewing tiny whipped stitches along this new edge. 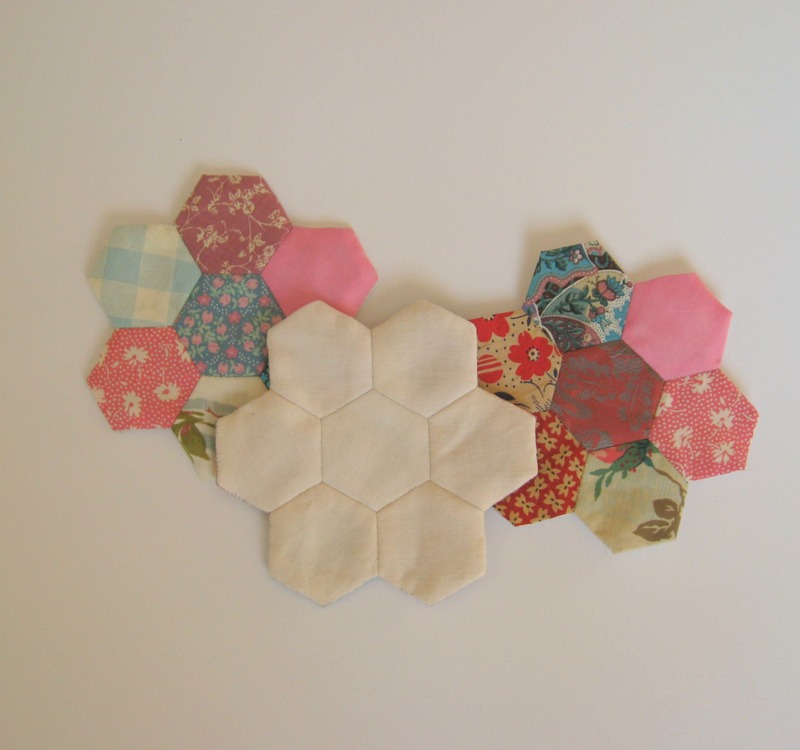 The paper hexagons will fold really easily so you can bend them over in your hands as you are sewing along the edges. 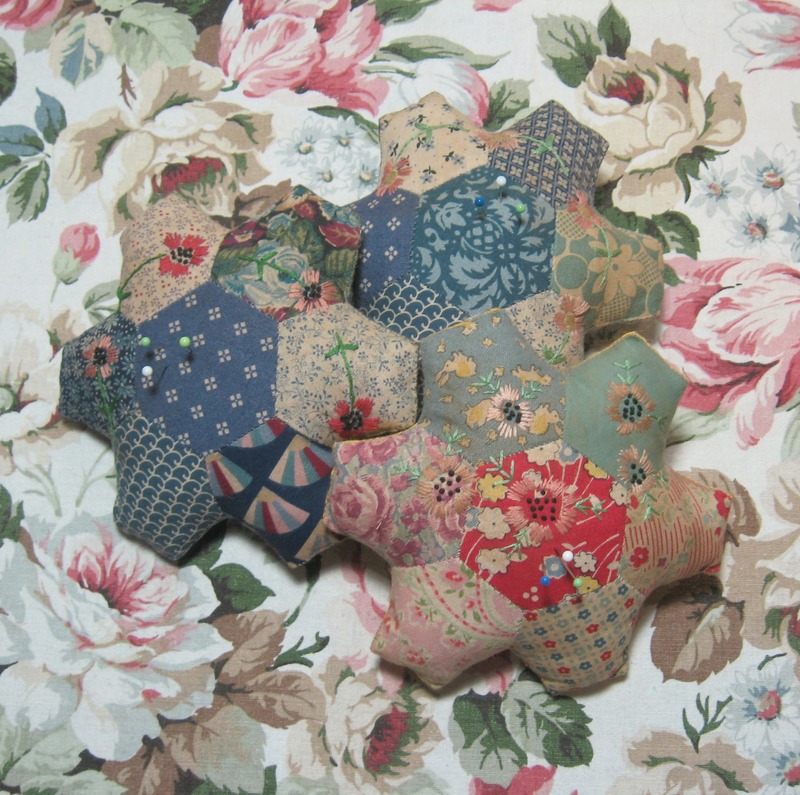 Keep joining the hexagons around the first shape until you have your first cluster of hexagons……at this point you can join two clusters together to make a very traditional pin cushion. 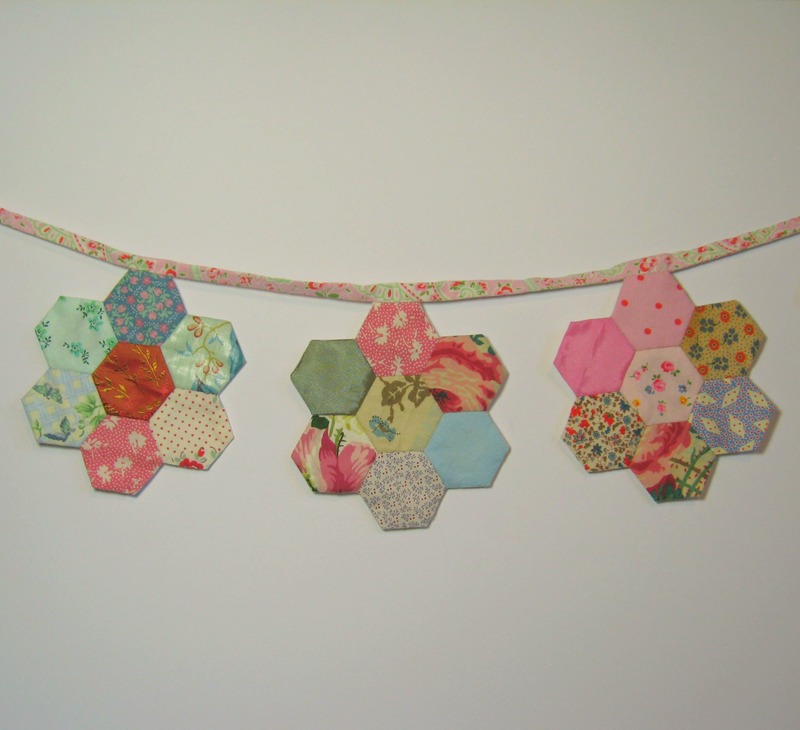 This is also how I made my hexagon bunting. I really like to spread the hexagons all around where I’m working, I try to use as many different prints and patterns as possible and by spreading out and making a bit of a pickle, I get to see more of the available choices that are waiting to be picked up and sewn into place…..
Keep working outwards, I prefer to piece until I’ve got a few rounds made before I fill in the sides, although sometimes I join up lots of smaller clusters together rather than making one big piece. (If I’m on the train then making small 7 piece clusters is easier than manoeuvering about one big piece)……. 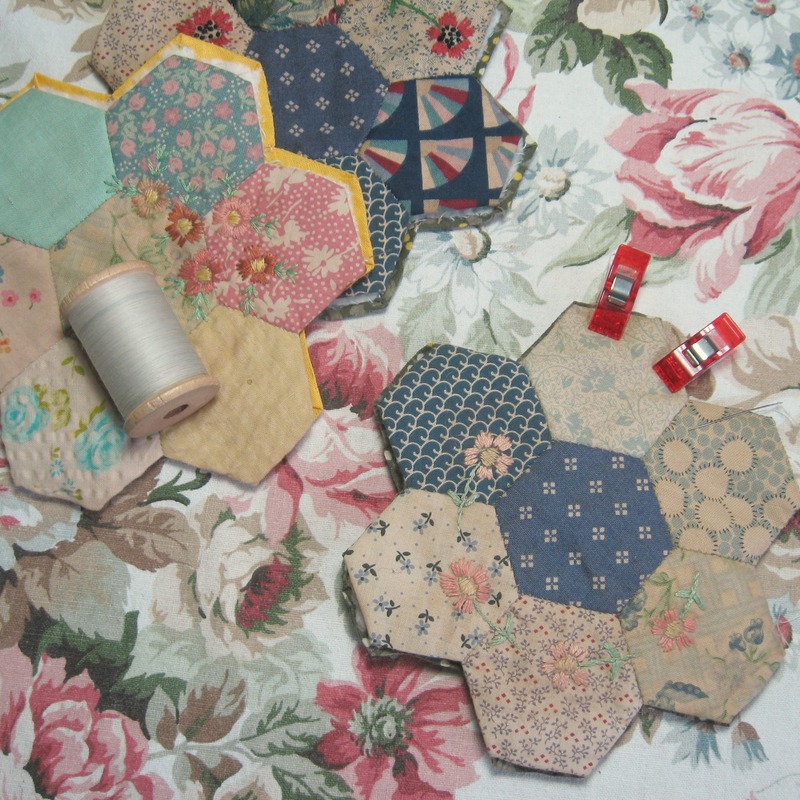 This was how I worked the hexagon wrap that I made my eldest sister the other year for her birthday….however because I want these hexagons for a big square cushion then I’m finding it easier to keeping working outwards until it’s the height I want….a couple more rounds and I think I’ll be there. 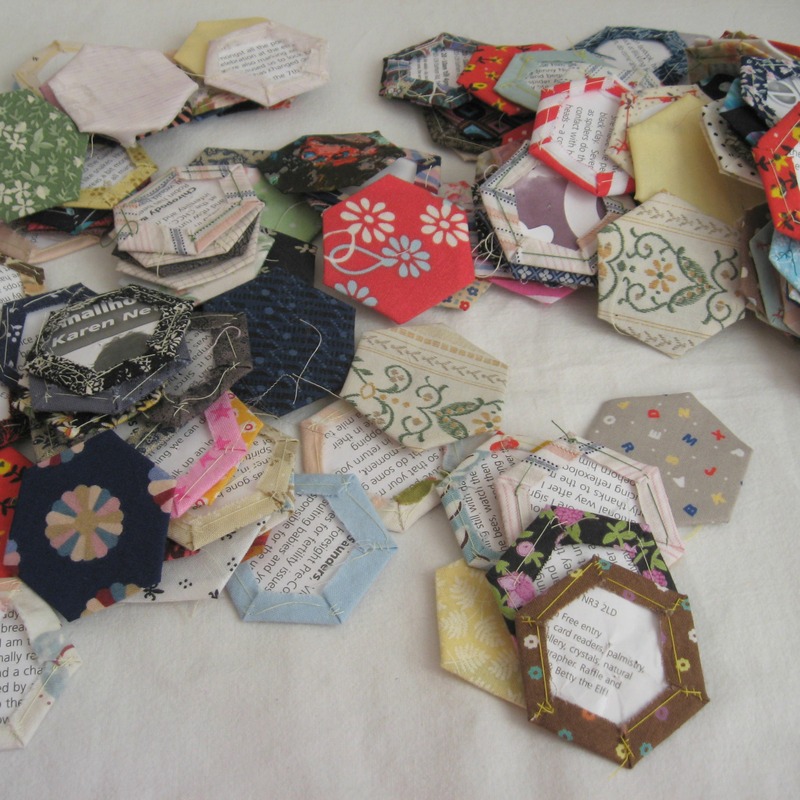 *when I’m sewing patchwork together like for “dear ethel” and aren’t sewing over papers, then I use pins, but when I’m sewing over papers then I find the Wonder Clips hold the papers together neater and I’m not having to force a pin through two pieces of paper. 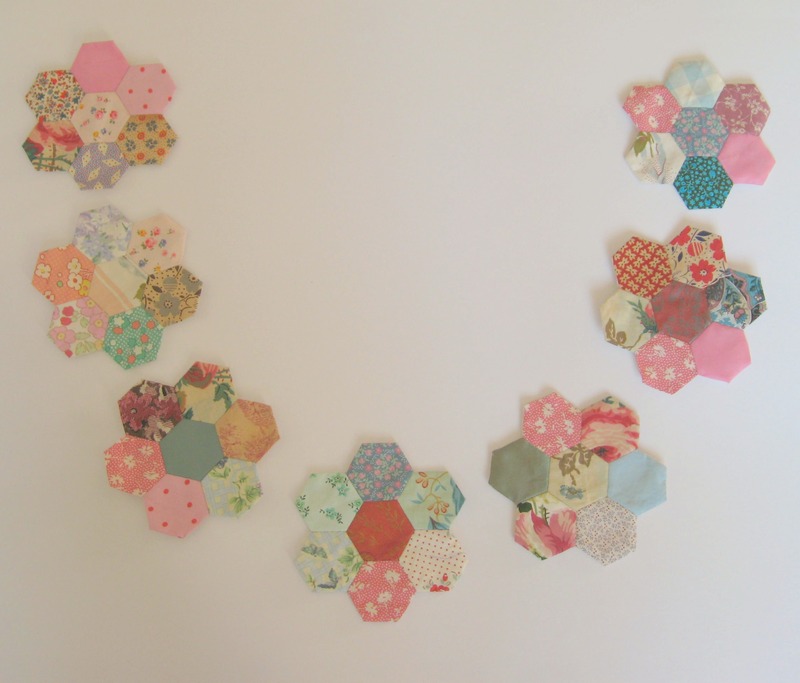 When I was having a bit of a tidy up last week I found a whole load of fabric covered paper hexagons…I’d already sewn some together in clusters but had obviously moved on to a new project and had promptly forgotten about them. As it’s so lovely and light in the mornings I’ve been getting up really early (this is also thanks in part to a certain gentleman that mews for attention at a most ungodly hour)…while the rest of the house is sleeping I try to be quiet so I thought I’d sew more of the hexagons together and make a couple of cushion covers. 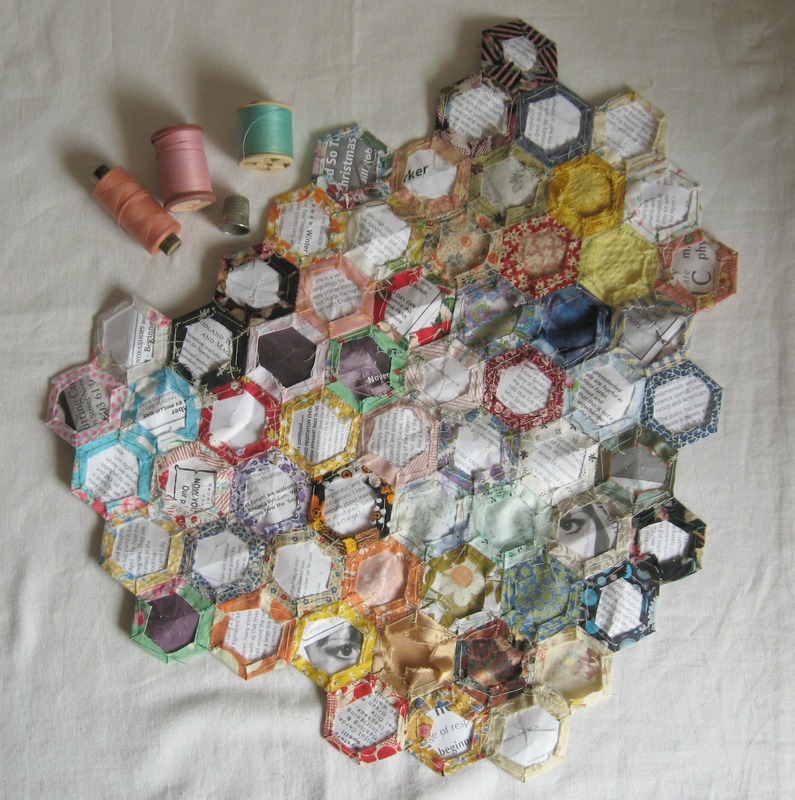 This set of joined hexagons is pretty much ready to have a back sewn on, the cushion cover will measure about 19 x 15 and a bit inches….and is made up of 123 little hexagons. 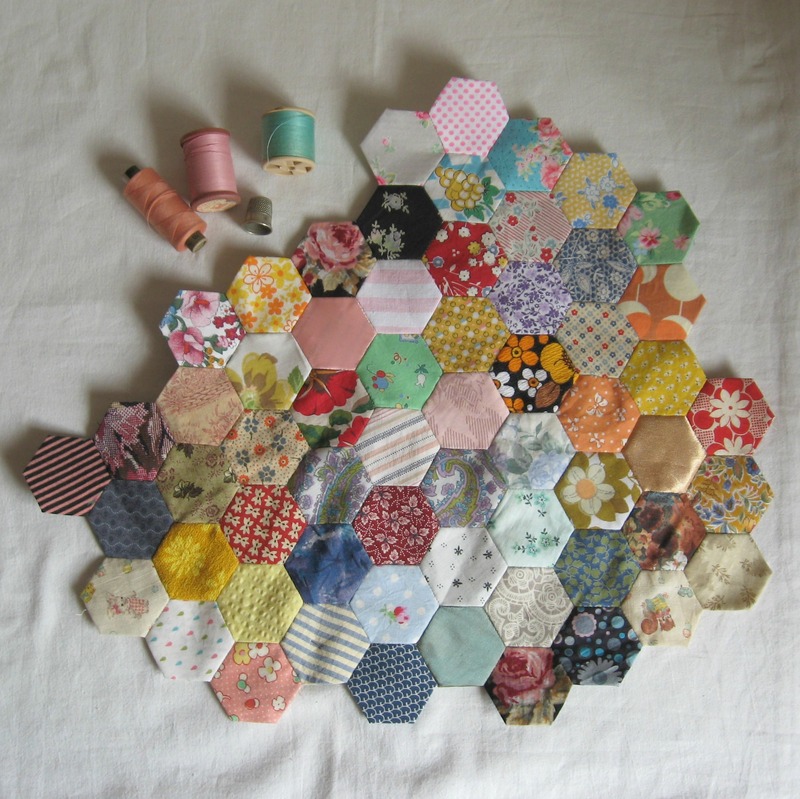 Once I start sewing hexagons I find it hard it very hard to stop, so I’ve begun piecing together some more to make another cushion cover. 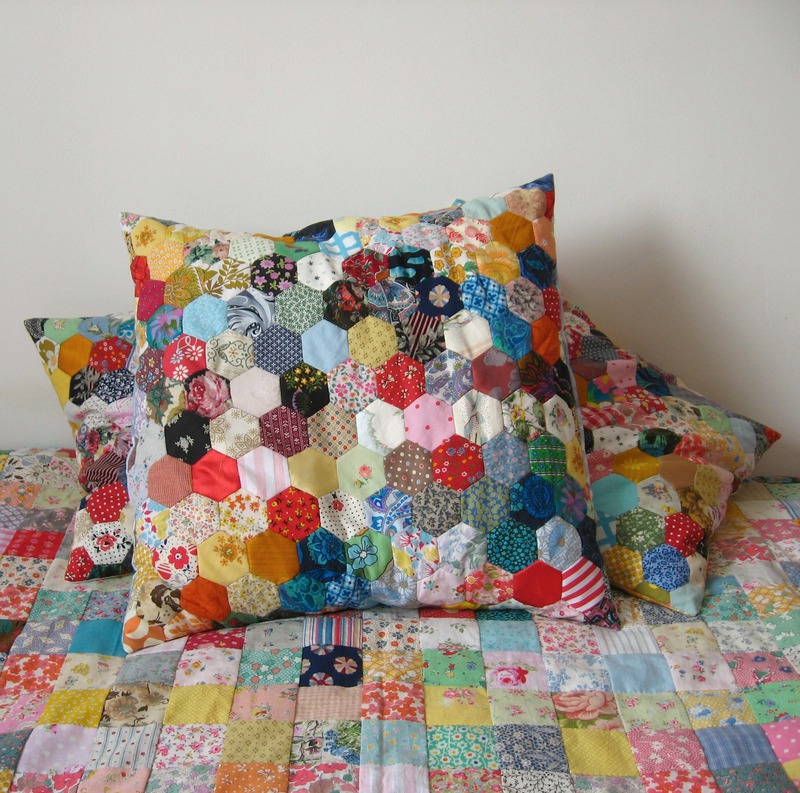 As well as being “thrifty” and making my own papers, I also like to make my own cushion inserts*…. 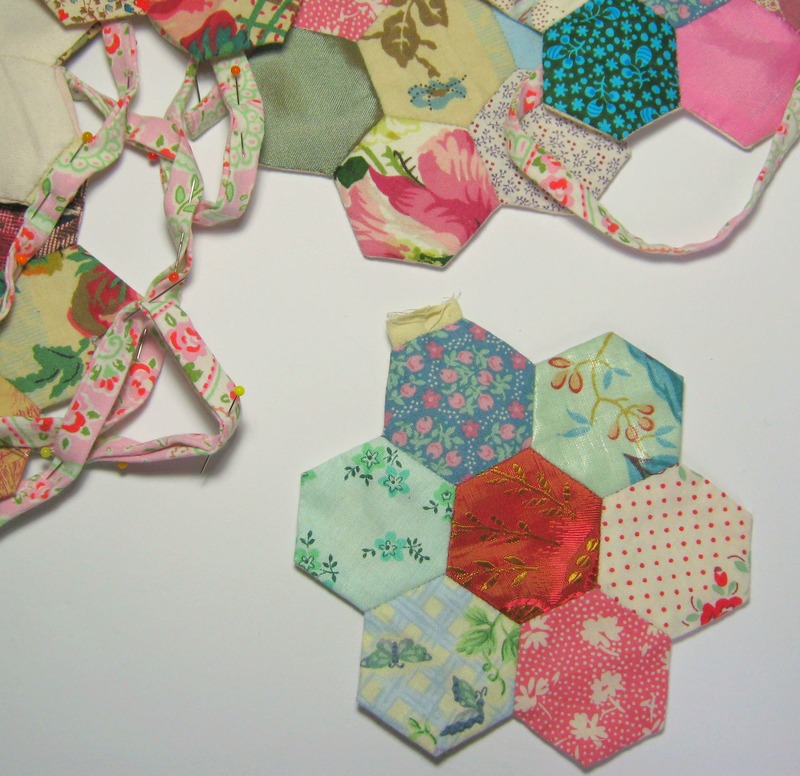 I’ve sewn the hexagons together pretty randomly, I try not to use the same print or pattern too often and try to mix up the colours and tones as much as possible. 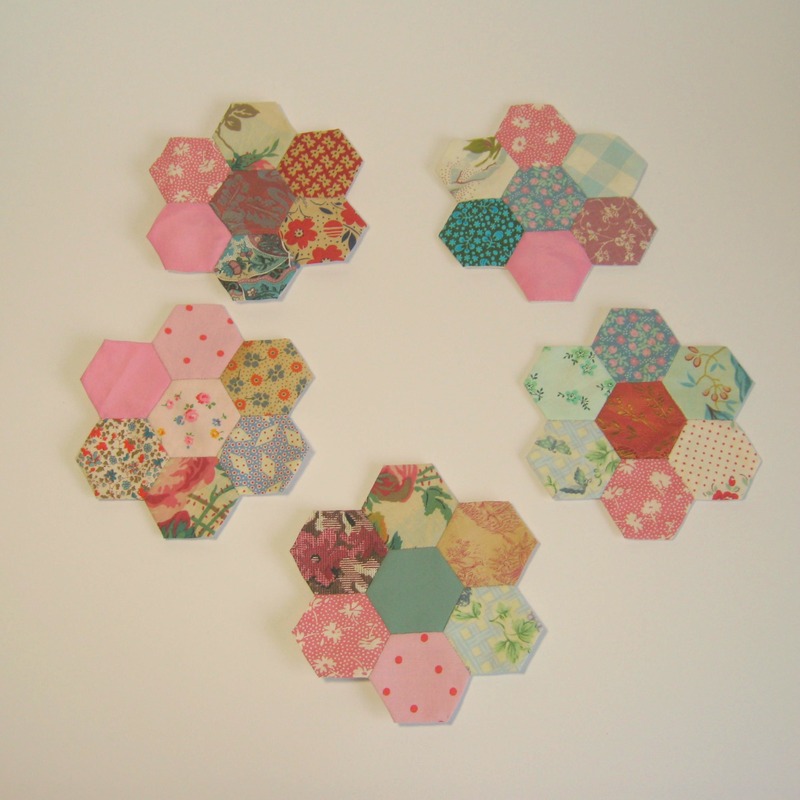 Making hexagons is a great way to use up odd shapes of fabric from a scrap box, I like to pin my hexagon in place on the fabric and then cut round it, generally leaving a generous 1/4 inch seam allowance (5/8 inch if possible) and then I sew the fabric over on it’s self, securing all the corners with 3 or 4 small stitches.. I don’t sew through the paper as I find the slightly extra seam allowance holds the hexagon template in place fine, and it also saves having to unpick all the basting threads…..sewing the fabric over the corners means the hexagons keep a nice neat shape and adds an extra bit of stability to the patchwork. 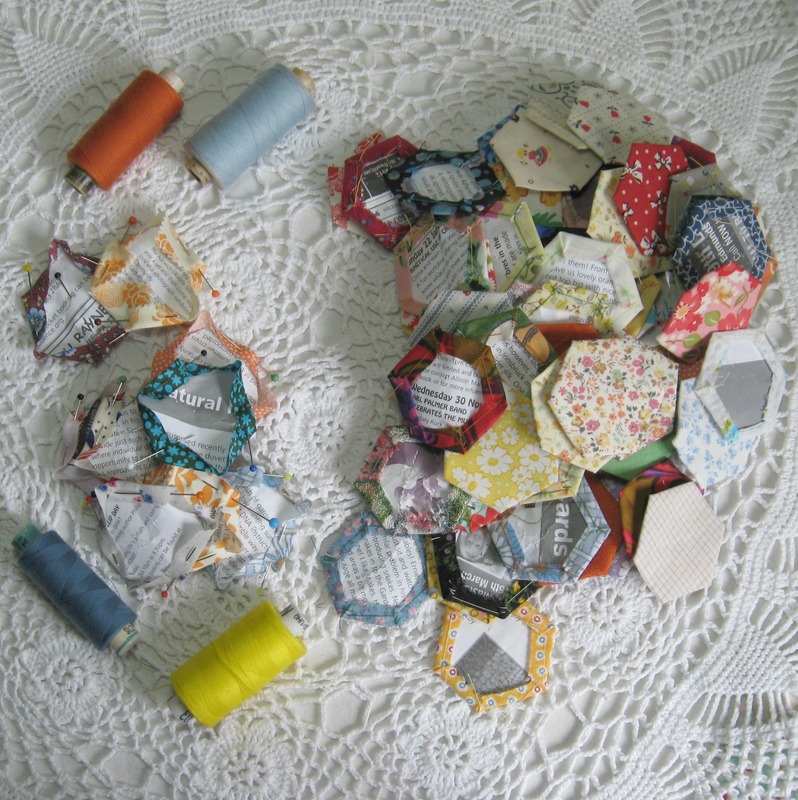 And I like to remove them from the centre of the patchwork, keeping them in really only the outside edge. My sewing work box changes with each new thing I’m working on at any one time…when I’m making posy brooches then there are fat wool needles tucked into a piece of blanket fabric, transparent threads and pieces of felt, brooch pins and small fabric scissors, today it’s full of a selection of vintage threads (I like piecing the pieces with pink and brown threads, I find they blend as well as traditional grey), a needle-case full of super fine sharps and applique needles, odd papers that I remove from the patchwork centre, a handful of Clover wonder grips which I think hold the hexagons in place better than pins and my most poshest ooh lah lah embroidery scissors. *All the wool fabric scraps that get left over from when I’m sewing Christmas stockings, tea cosies, hot water bottles and coat hangers, gets cut up into small pieces and then I sew together a couple of big squares cut from old curtain lining or a couple of fat quarters of an un-wanted fabric to make a pocket which I then fill with the fabric snips. This makes for a lovely fat cushion which you can plump up like a feather one, and which gives a good home for fabric pieces which you can’t really do a lot with. I’ve been working on some new sewing pieces for my folksy shop in time for Christmas, these are a few of the pin cushions I’ll be listing shortly. I took some with me to the Glory Days Christmas Fair on Saturday and was receiving lots of compliments on tiny stitches etc….I laugh because I know I’m a proper old fuss pot, and really am the first to admit it, if I’m not happy with what I’ve made then I’ll unpick it until it is just so. Someone kindly said “oh that’s not being fussy, it’s just being particular”, which I liked very much, so a big thank you to the gentleman who told me that. Anyway, I thought I’d let you decide for yourself whether I’m particular or just an old fuss pot………the yellow and green hexagons were some old pieces of patchwork I bought the other year from an antique shop, to be honest they weren’t sewn together very well, so I unpicked them and then arranged them into yellow flowers and green flowers. 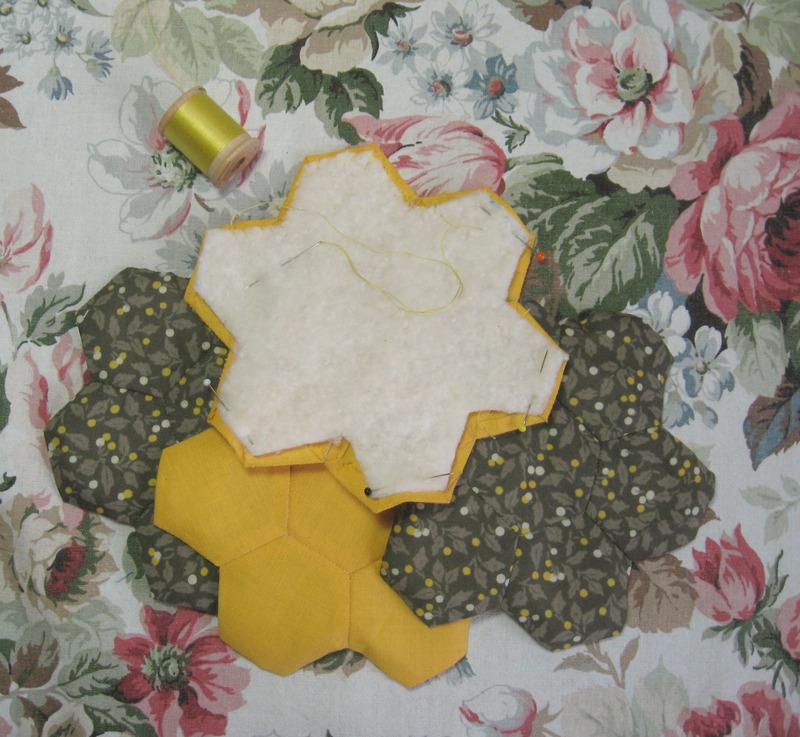 Once the pieces are sewn together I then like to sew in a piece of quilt wadding a little bit smaller than the “flower” formed by the joined hexagons. The fronts are embroidered with various vintage threads and silks. And the I’ve lined them with a piece of quilt wadding. Basically I hate lumpy bumpy pin-cushions, they remind me far too much of varicose veins and other un-slightly lumps, so sewing the wadding on the back creates a much smoother and rounded pin-cushion. The little red clips are the perfectly named Wonder Clips” by Clover. They kindly sent me the hugest box of them you ever did see and they are perfect for fiddly things like this. 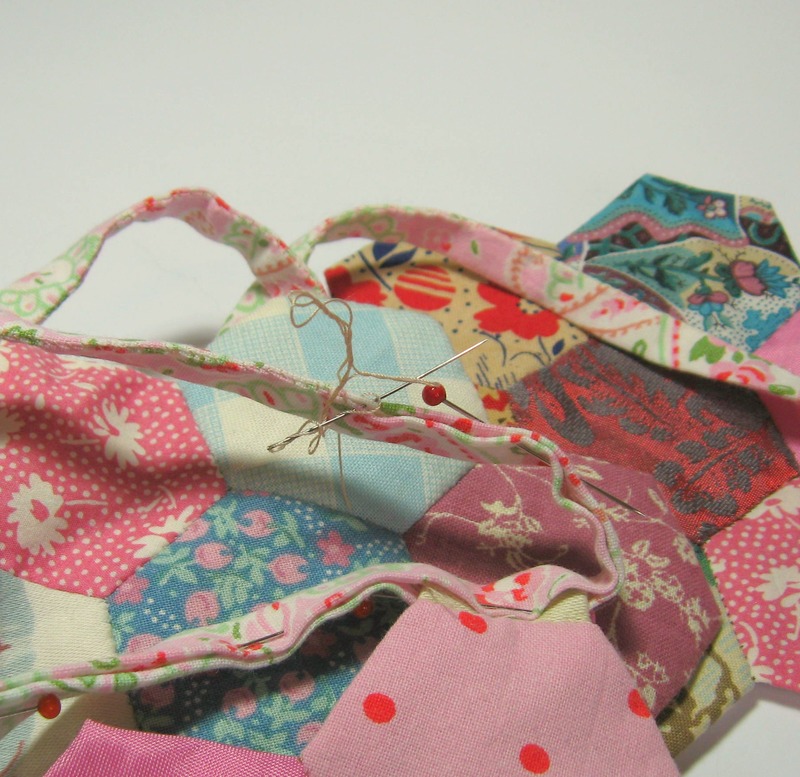 They hold the patchwork pieces fantastically tight, and there are no sharp pins to poke your fingers. This is what I use for stuffing …….every single little snippet of wool blanket that gets left over from Christmas Stockings, hot water bottles, tea cosies gets chopped up small and makes the best filling ever…..I also use pieces of lining fabric, quilt wadding, tiny pieces of cotton that are too small to use in patchwork, woolly tails and strands of cotton…it all goes into the mix. 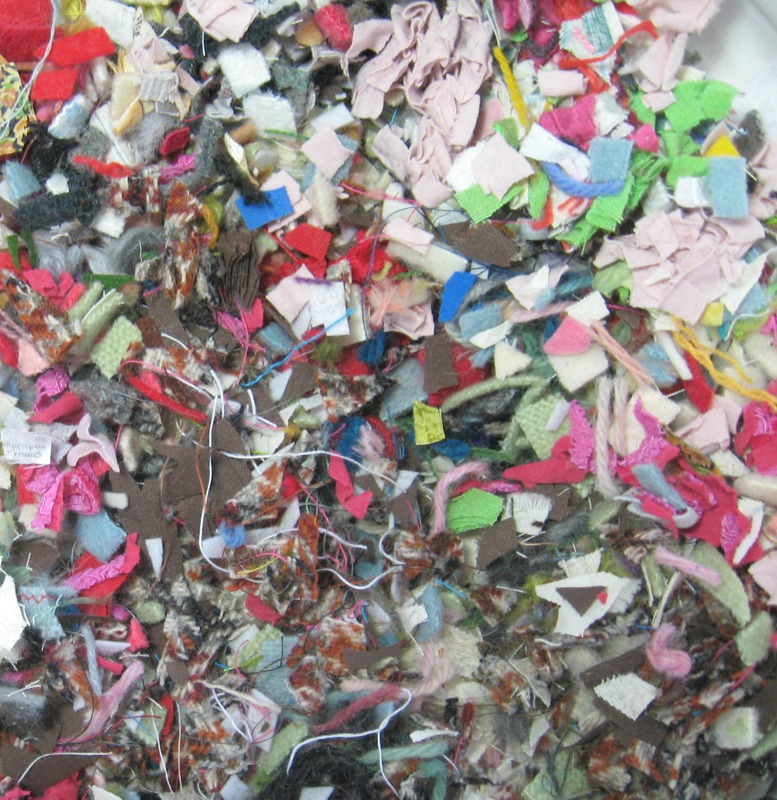 (it’s a bit like making Christmas mincemeat, or a chutney….) There are even some teeny tiny pieces of Harris Tweed from Ruby’s coat, too small to use but ideal for stuffing. I use this for all my pin cushions, and I use it for stuffing when I’ve made my nieces and Saski and Hania in Norway bunny toys (huge kisses being blown to you all). It also makes the best cushion stuffing, because you can plump up your cushion which you can’t do with the synthetic inserts. 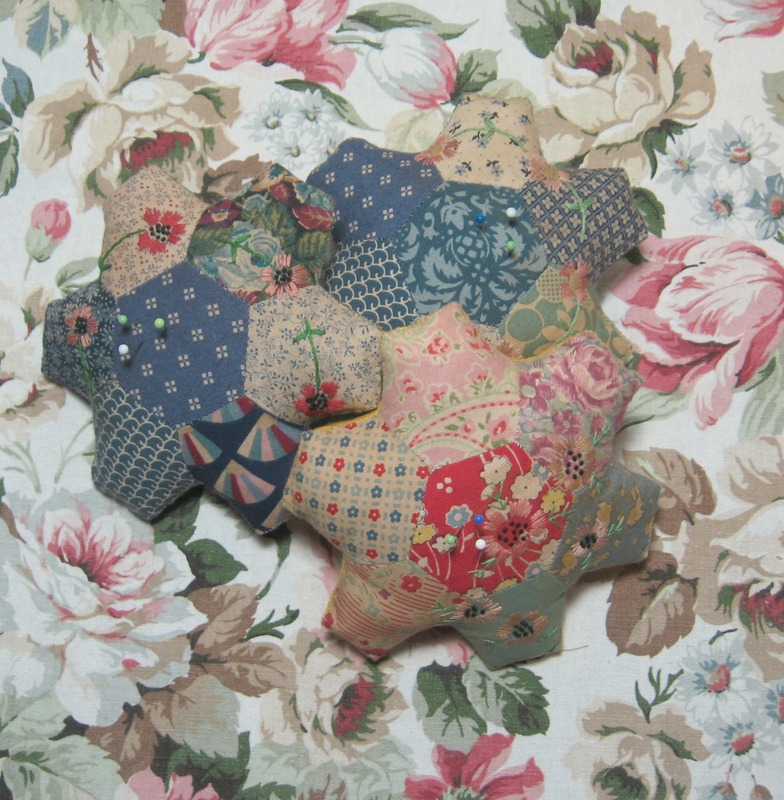 I like to really stuff my pin cushions so they are fat and plump (and also all that stuffing helps stop pins being able to poke all the way through)……finally I just sew up the last couple of sides, and then give them a few squeezes so they form a nice shape. 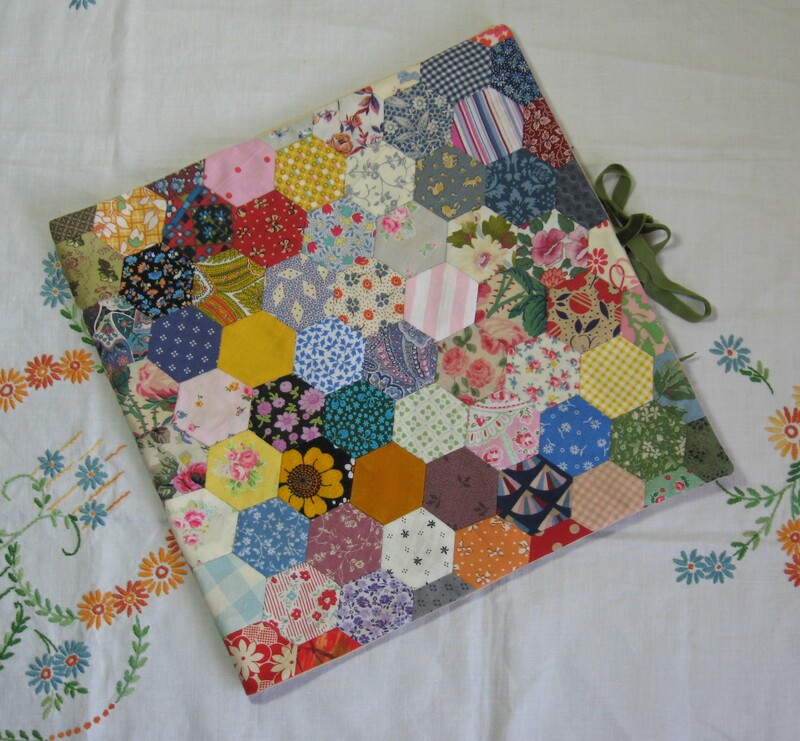 I love hand piecing hexagons, I know it’s not everyone’s cup of tea but it makes me very happy to sit and fold the fabric over and then piece a big box of them together…..one of my favourite pieces I made was this hexagon notebook cover for my eldest sister. * at Christmas we have a chestnut and mushroom wellington with veggies rather than anything with feathers and a face. 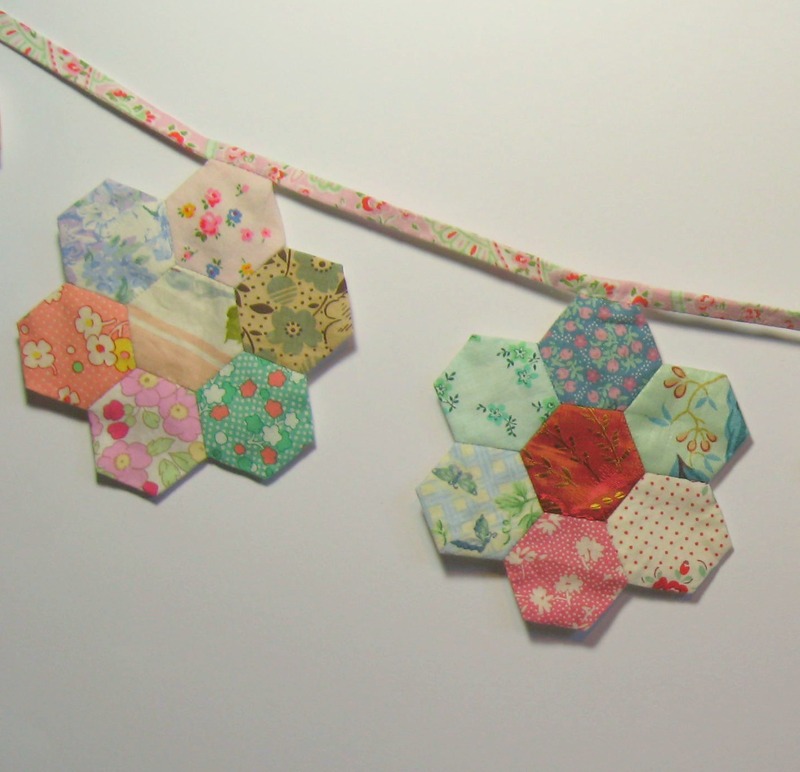 When I originally made these I found that the hexagons weren’t hanging quite right, the binding needed something a bit more sturdy to be sewn to rather than just the top of the hexagon. So I unpicked the top edge and inserted in a piece of cotton fabric (just a scrap of the curtain lining which I had used to piece the hexagon backs). This needed to be folded double and then I turned the raw edge over before lightly sewing the seam. 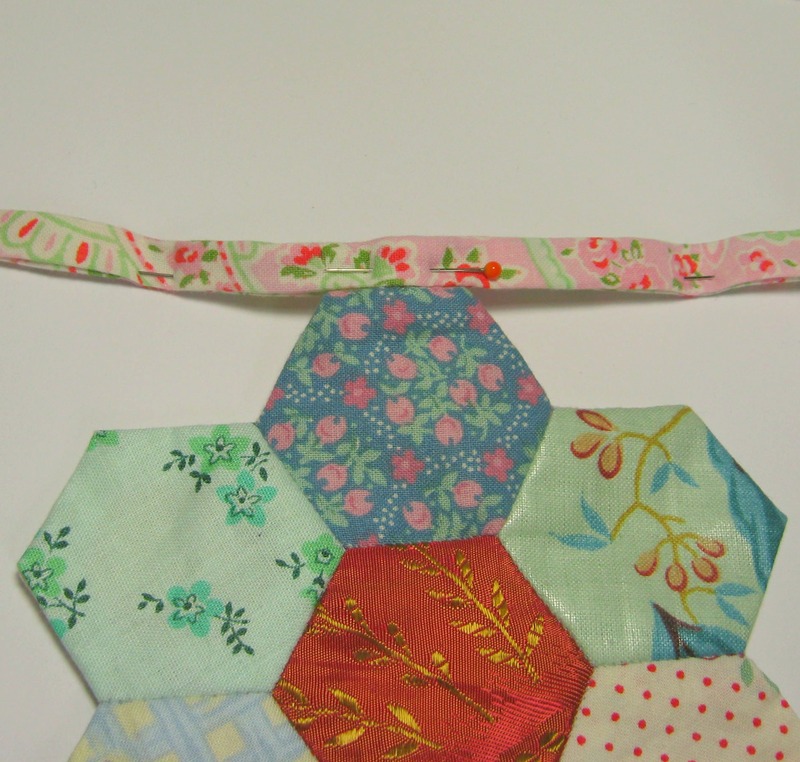 Attach one side of the hexagon to the “tab” with a small whip stitch, and then turn over and join the second side. 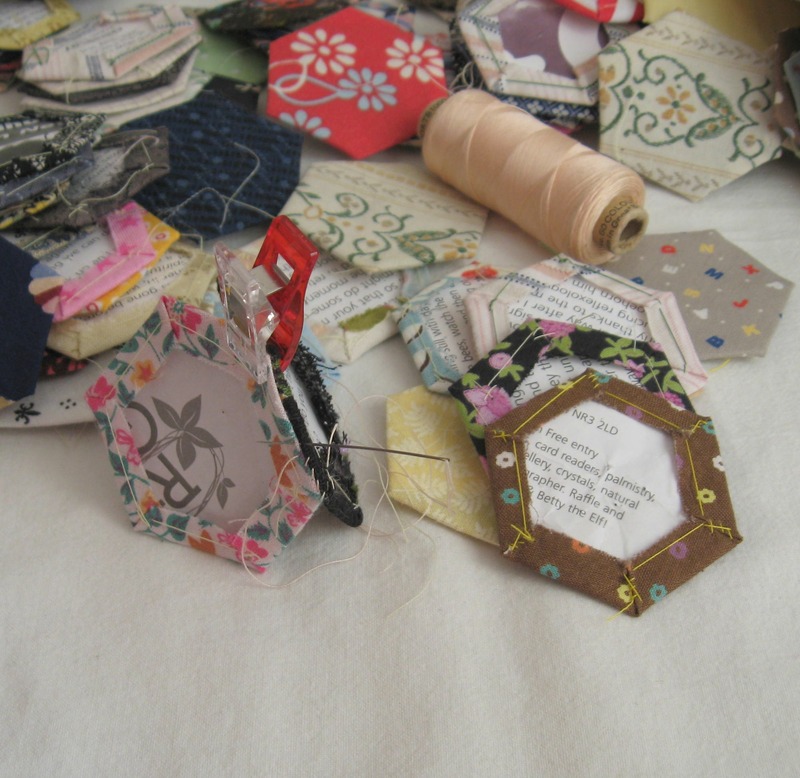 Then I placed the “tab” of the hexagon in between the folded edge of the binding. And pinned it in to position. Using a really sharp and fine needle I stitched the seams of the binding closed. 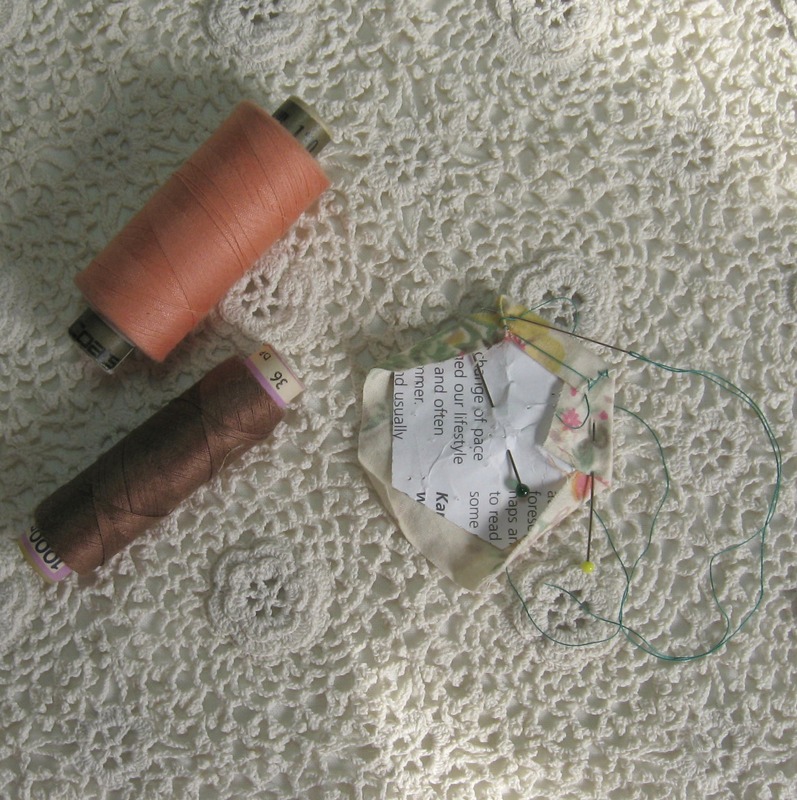 I always call the stitch I do a whip stitch, but I think it is in fact more of a blind hem applique stitch. 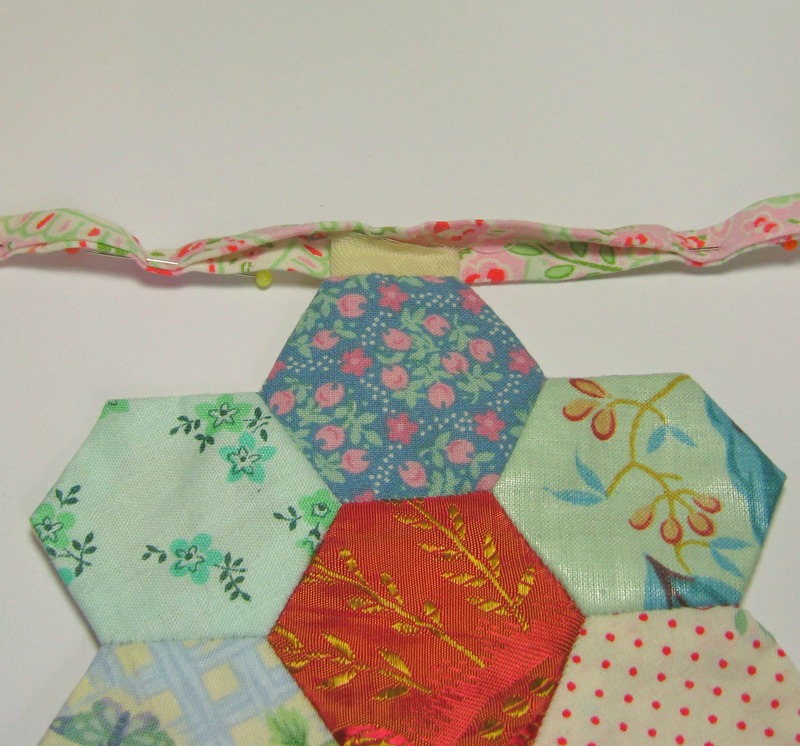 I sewed the binding first to one side of the “tab” and then turned the hexagon over before sewing the other side down. It is a bit fiddly and isn’t done in five minutes (two episodes of Inspector Morse is more like it) but I just thought it looked neater than sewing it closed on the sewing machine. 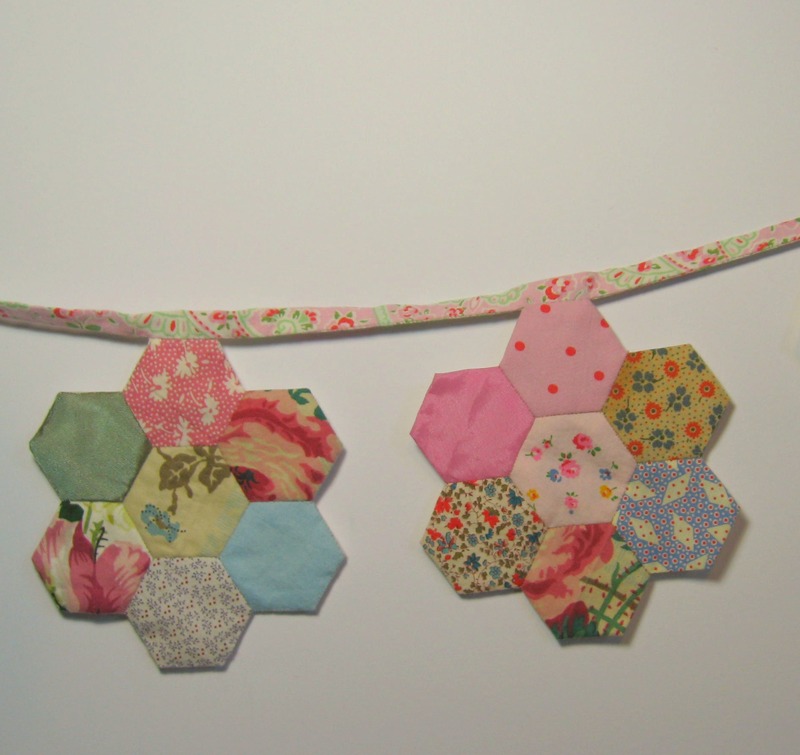 So finally I had a finished cluster of hexagon bunting….. I just think these look so pretty and colourful. The binding is extremely wonky, rather than cut a new piece of fabric I just folded over a long off cut I’d already got (I think it was originally the inside hem from an Ikea duvet cover), and just trimmed off the over locked edging. After I’d got about half way I thought I could have used up some old vintage binding which is being hoarded for a rainy day. 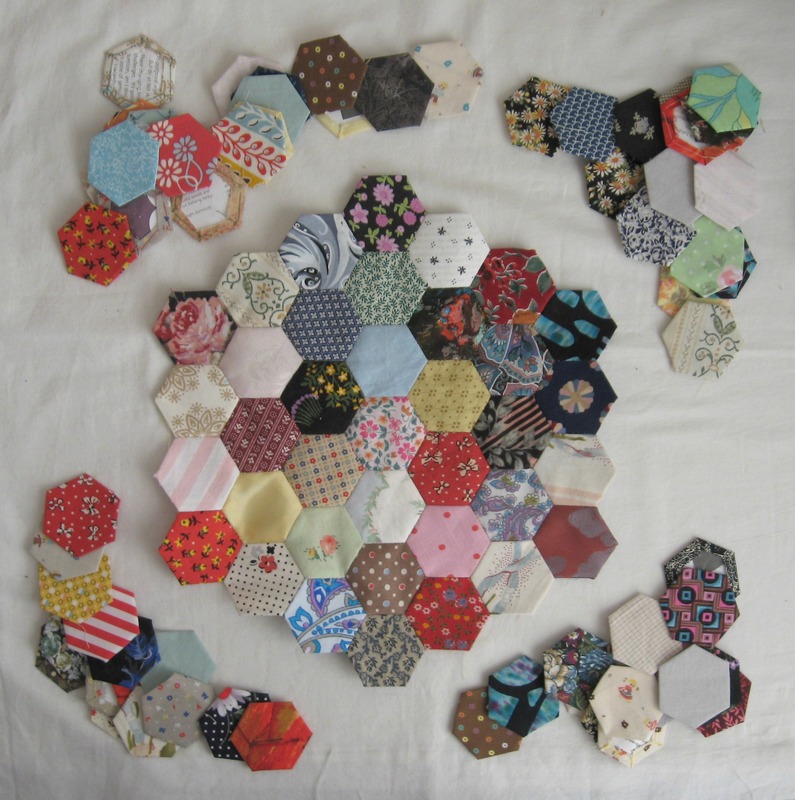 And if I do make these again then I would sew the joined hexagons over a central “flower” shape of pelmet stiffener… just because the light really shines through the fabric which seems to highlight the patchwork pieces, making the patterns on the fabric harder to see. I’ve just been standing in the front room admiring my handiwork and I’m thinking some hexagon bunting would also look very nice hanging in our bedroom…..
About two years ago, I made some hexagon bunting for one of my friends, (we did a bit of a swop, she got some bunting and I got the most fantastic bunny which I hid in my sewing room a while before I could decide where I could put it so the Arpette wouldn’t notice it) and I thought it was about time I made some for myself. 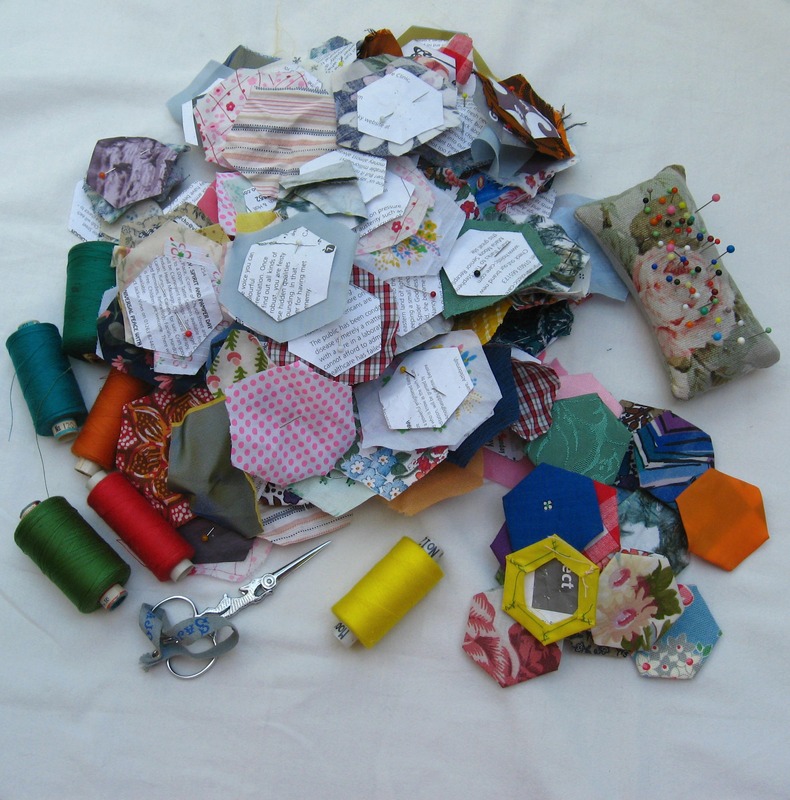 I’d already sewn the fabric around the papers (I’ve got a sewing basket full of some hundred fabric wrapped papers) so it was just a case of choosing my colour palette and hand sewing the hexagons together, using a tiny whip stitch. 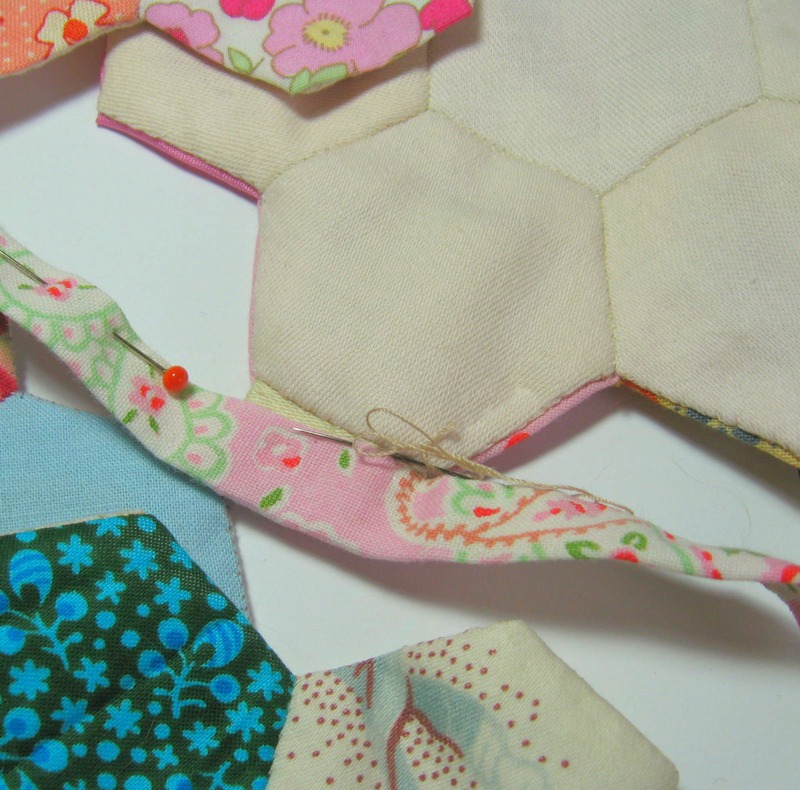 I’m quite happy to sit and sew hexagons together, generally I find hand sewing just as fast as machine sewing and it’s always a whole lot more relaxing. 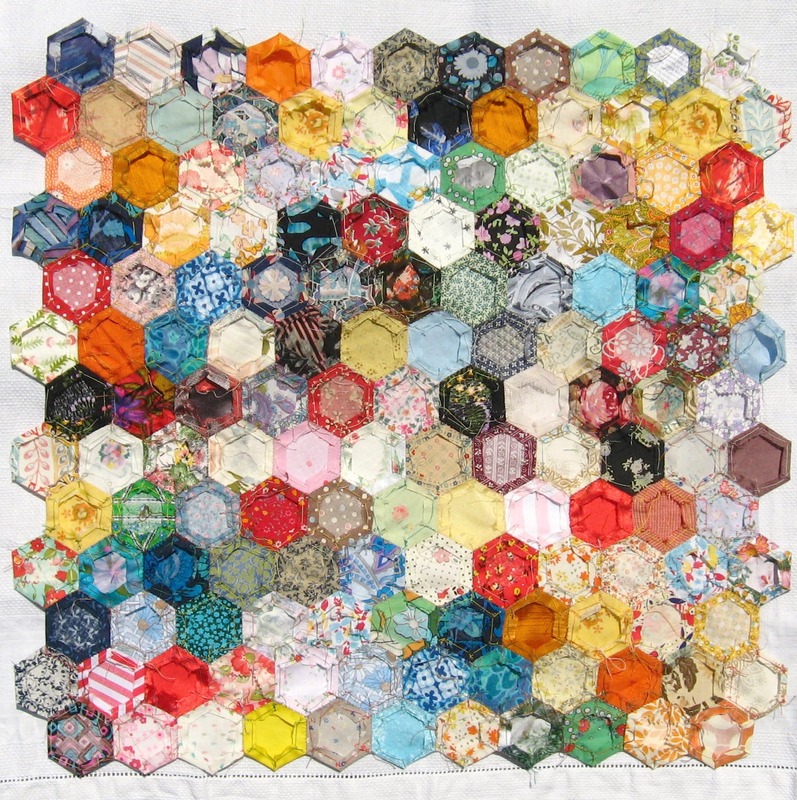 The hexagons are about 1 inch from point to point at the sides, or 2 inches across at the widest point. 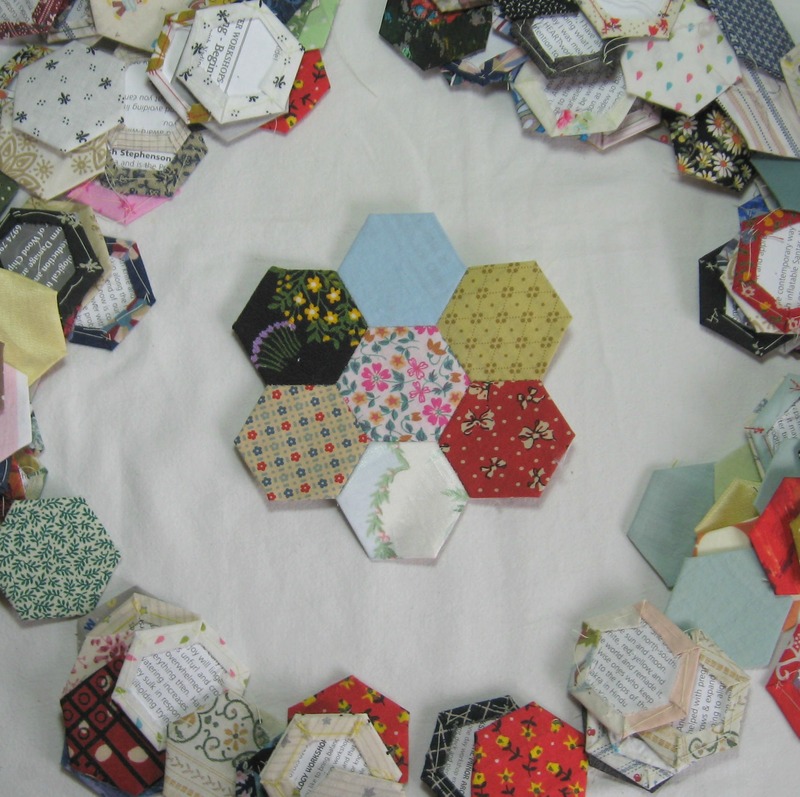 The finished hexagon clusters are a little bit bigger than the size of a cd. 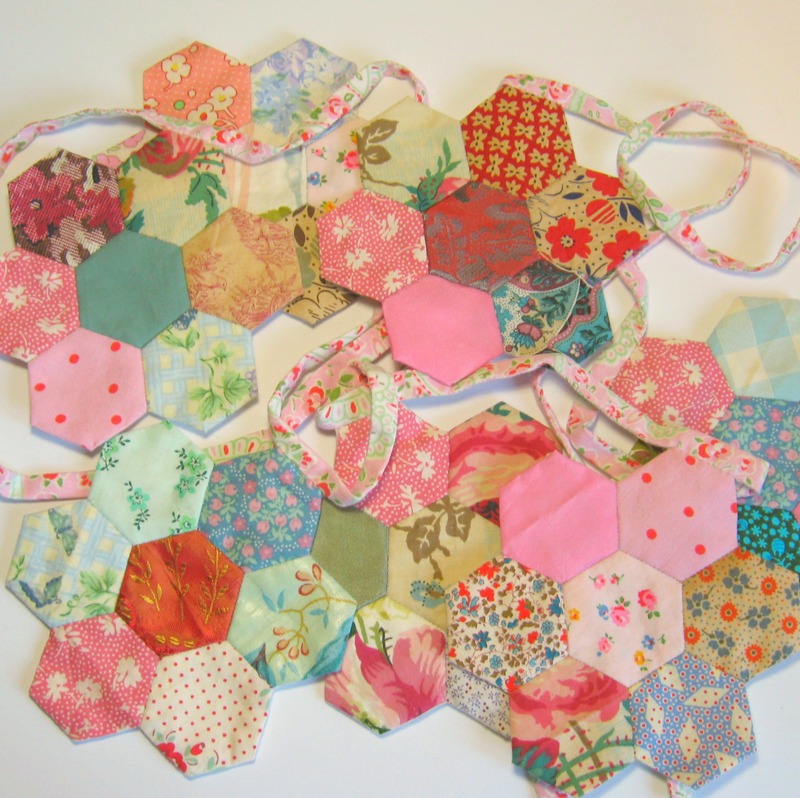 When I was sewing the hexagons together, I used some of the Wonder Clips made by Clover. The more I use these the more I love them. 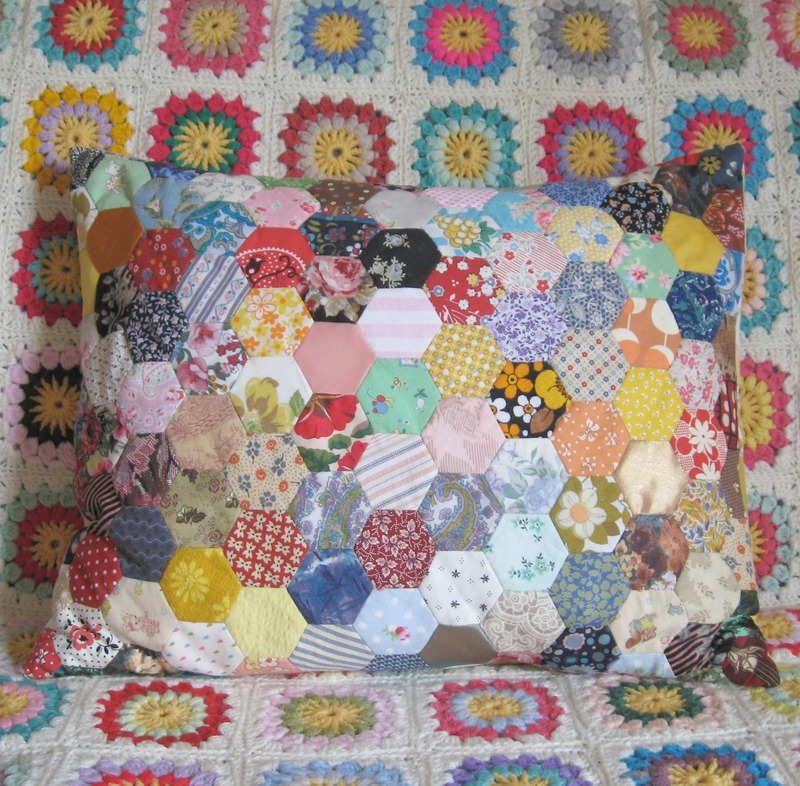 Patchwork, cake and a crochet blankie….. Finally I get to say it ….. Ta-dah !!!! 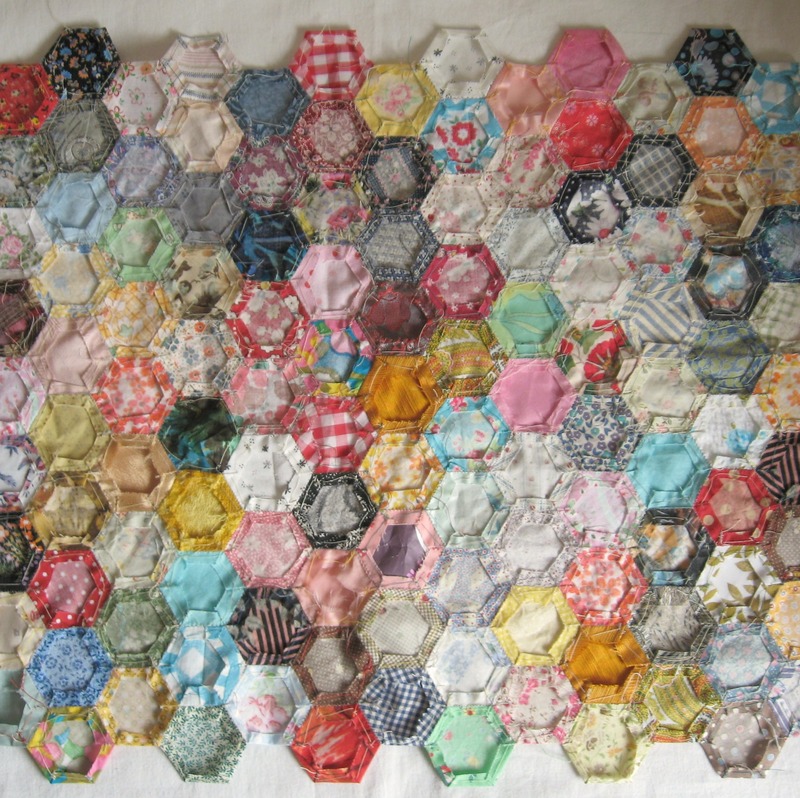 The hexagon patchwork is finished, and it is all ready to be sent to my big sister (it’s her birthday today so Happy Birthday Nicky!) It’s a bit hard to see what I’ve made from the photos, but it is a wrap for a ring-binder so she can keep all her quilting patterns together in a fancy place. I actually finished sewing this about 8 o’clock last night so totally missed sending it in yesterday’s post but it will go first thing tomorrow. 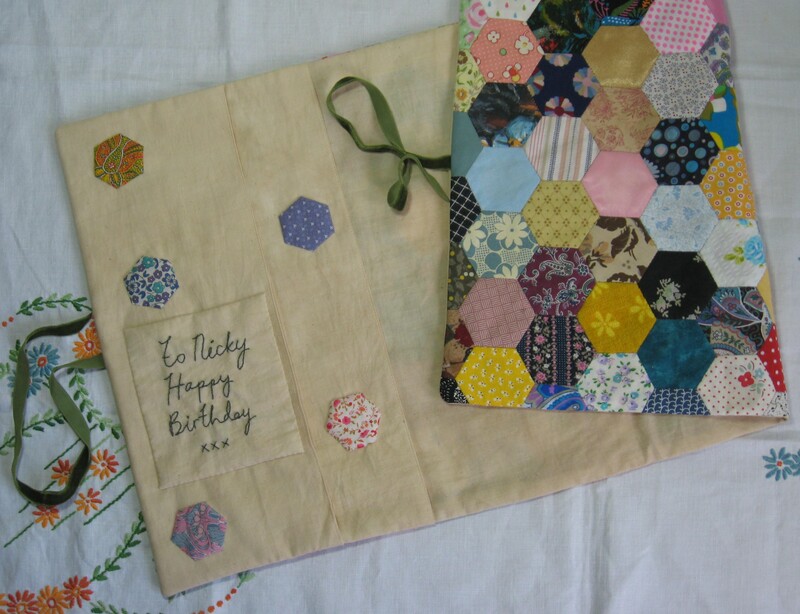 We’d had tea and cake a few weeks ago and she told me that she really liked hexagons that are hand pieced but doesn’t have the time or patience to make them herself, so on the bus journey home I started thinking about what she’d said, and as it is a very special birthday I didn’t mind spending the time sewing all these hexagons together. As I wrote in the previous post a lot of these fabrics mean a lot to me but I hope she will be able to recognise a few from things I have previously made her. Inside there is a pocket in the front and back so she can keep template plastic and such like in there, I’ve also embroidered a little message to her and have appliqued some hexagons inside (these are about the size of a 50p). I really did have the very devil of a time sewing this, I couldn’t understand why it kept sewing up small (I’m not mentioning the fact that I also managed to sew it all back to front…twice) I kept measuring all the fabrics and it all looked fine but as soon as it was sewn together the pieces would not fit. 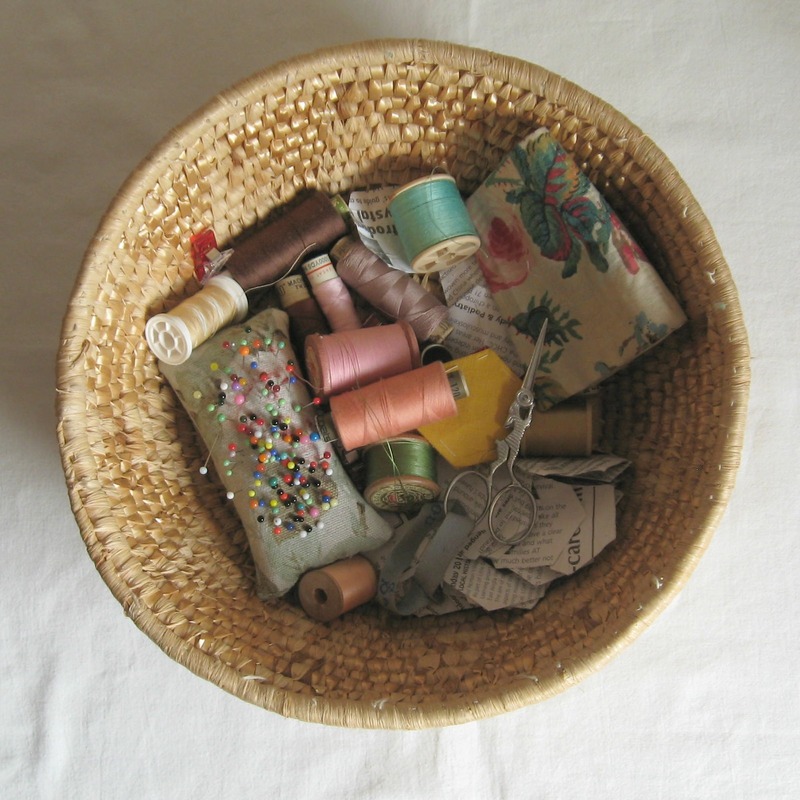 Then I measured my measuring tape….. yeah, those lovely old cotton measuring tapes may look awfully pretty but they do stretch…try stretching a whole extra inch over 12 inches (what I thought was 12 inches was in fact 13 inches). As I was then using a plastic rule and rotary cutter to cut the fabric out I didn’t realise that all my pieces were a whole inch too small. Pants indeed. 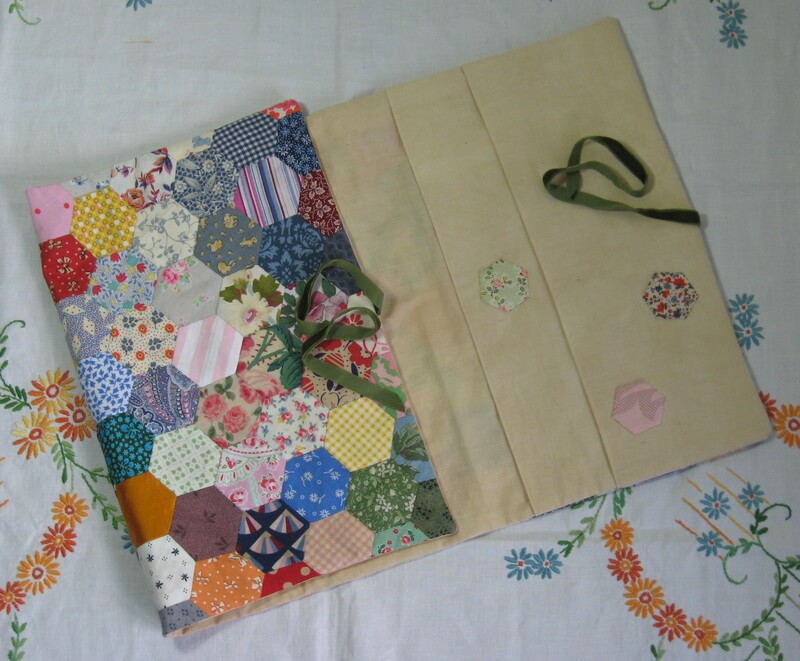 I’ve made patchwork book jackets before for small notebooks, but then the patchwork was squares and it was easier, but I’m really pleased with how this has turned out, and fingers crossed, big sister Nicky will like it too. After a whole day of sewing yesterday, today has been a lot more active. I was hoping to go sloe picking with the delightful miss Daisy, so was up with the lark (or so it seemed to me at any rate….I’m not one for actually getting up too early at a weekend) and made a cake, but then it rained so hard that sloe picking was cancelled. Then the sun came out and the day looked quite nice, so I went for a good long walk with a couple of lovely Italian ladies that I met last week on the bus and who are lodging with one of my neighbours. They have given me a recipe for Apple Grappa so think I’ll be making some of that to help warm the cockles over those chilly February evenings. 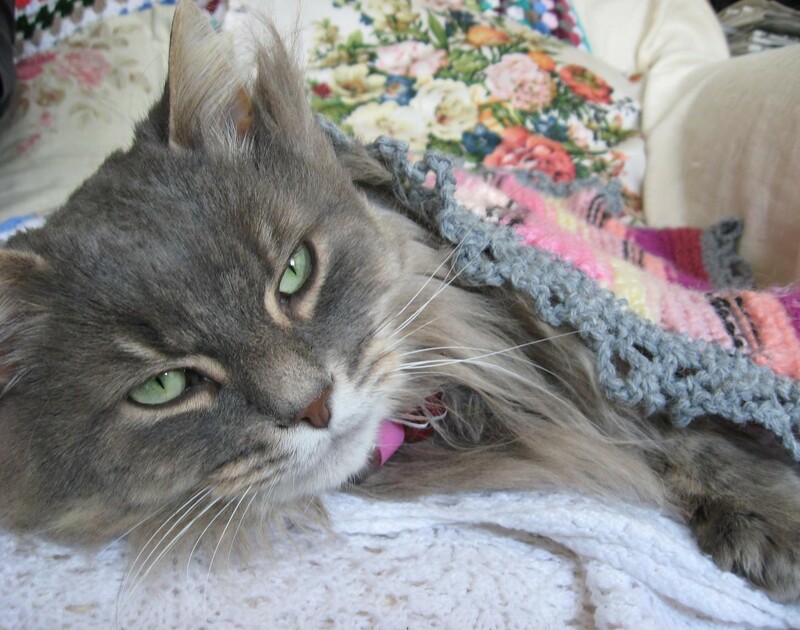 Needless to say, some of us (those of us who woke up at 5o’clock this morning requiring a tummy rub) are having a somewhat more relaxed day, and are just vegging on the sofa with a crochet blankie.